I don’t know about you, but when April comes each year, I start thinking about spring blossoms, new beginnings and travel. In particular, travel to Italy and the beautiful town of Varenna along Lake Como. April is also a time for spring cleaning, not just of your closets, but a time to reassess all those projects you’ve been meaning to tackle. Maybe one of them is writing down some of those family stories you talk about across the dinner table; a childhood memory that’s starting to fade; or a funny incident that happened in high school. 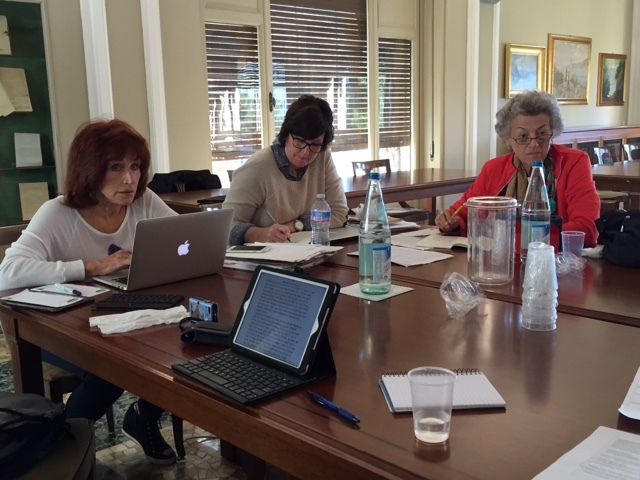 Our writing retreat, “Italy, In Other Words,” is the perfect place to put pen to paper and memorialize those thoughts for future generations. If you don’t write it down, it may be lost forever. 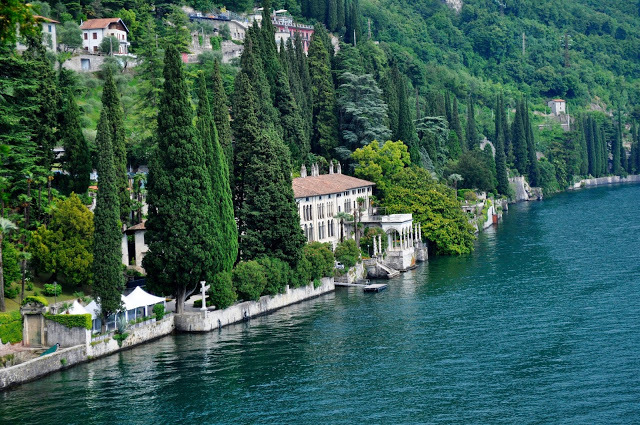 And can you imagine a more inspiring place to write than by the shores of dreamy Lake Como? You don’t have to be an experienced writer to participate. Of course, we’ve had plenty of guests who’ve been teachers or writers or worked in publishing, but we’ve also had participants who were nurses, stay-at-home moms and even a postal worker. You just have to have a desire to learn and a willingness to collaborate. Kathryn Abajian, a college professor of creative writing, will help you craft your thoughts into expressive prose that you can feel proud of by the end of the week. But we won’t harness you to a desk all week. Oh no, mornings are for workshopping, but afternoons you’re free to wander on your own, read, write or take part in the short excursions I’ve planned for you. 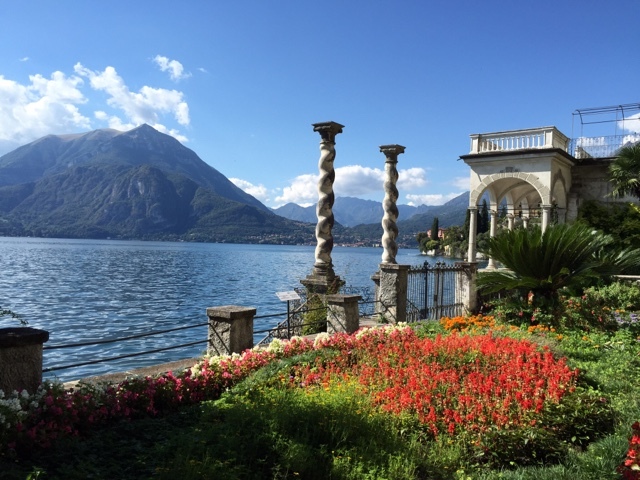 Come with us to the internationally renowned gardens and exquisite rooms of the 13th century Villa Monastero, where Nobel prize-winner Enrico Fermi once lectured in physics. 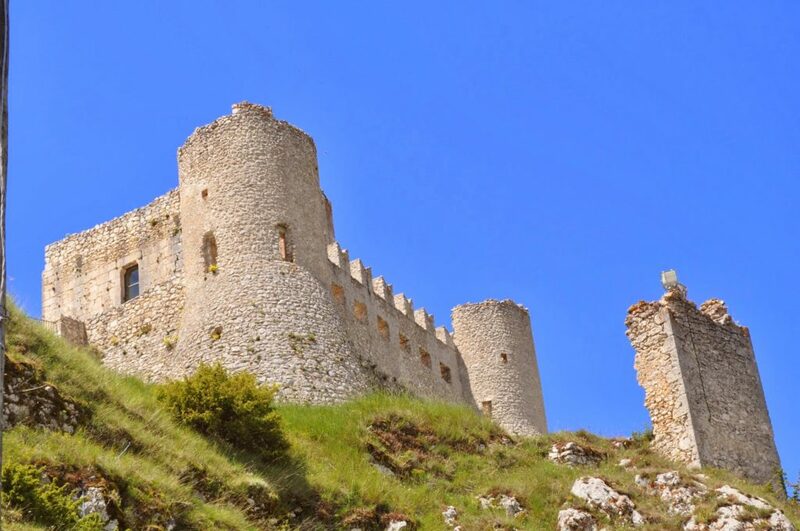 Join me on a jaunt to the ruins of an 11th century castle, high above the town. 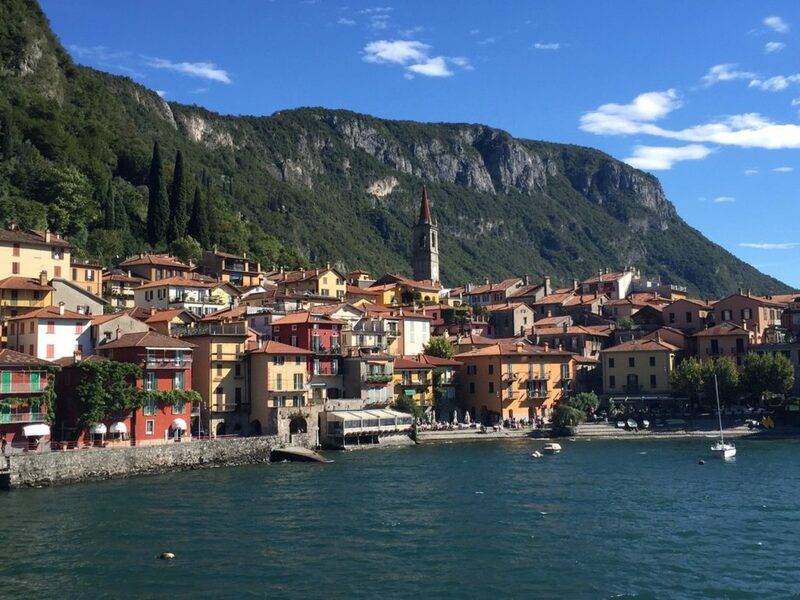 Another afternoon, we’ll take a boat across the lake to Bellagio, where you can shop for silks, leather goods or myriad other items with the “made in Italy” label. 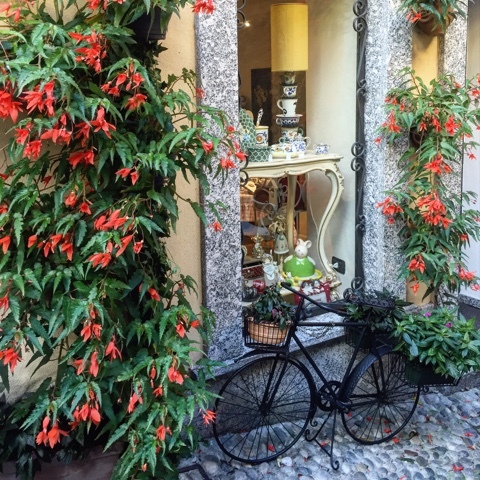 Stay for dinner and enjoy a delicious meal with us on a patio shaded by flowering vines, before heading back to Varenna by boat. 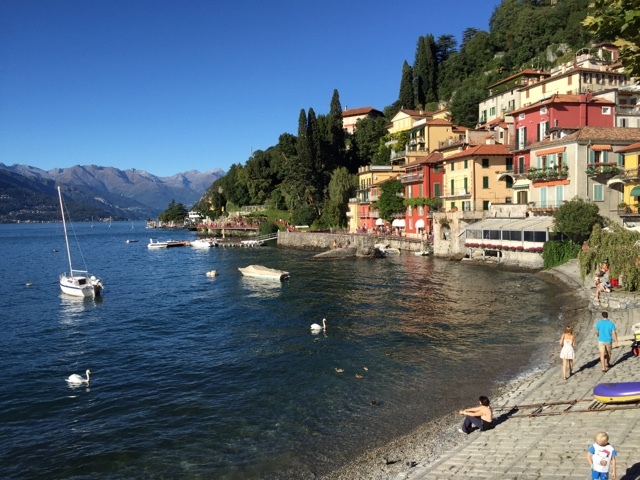 Other afternoons, you may just want to sit at one of the many cafes by the lake, waiting for the muse to strike, while enjoying a gelato or a spritz. 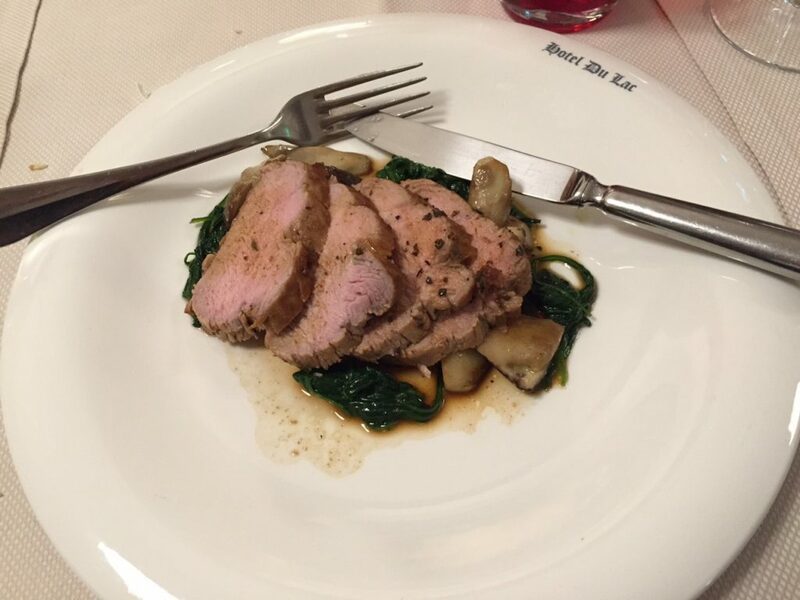 Over the years, I’ve hand picked some favorite restaurants for you to try, where the food is always top notch. You’ll stay at the beautiful Royal Hotel Victoria, with your own private room and bath. 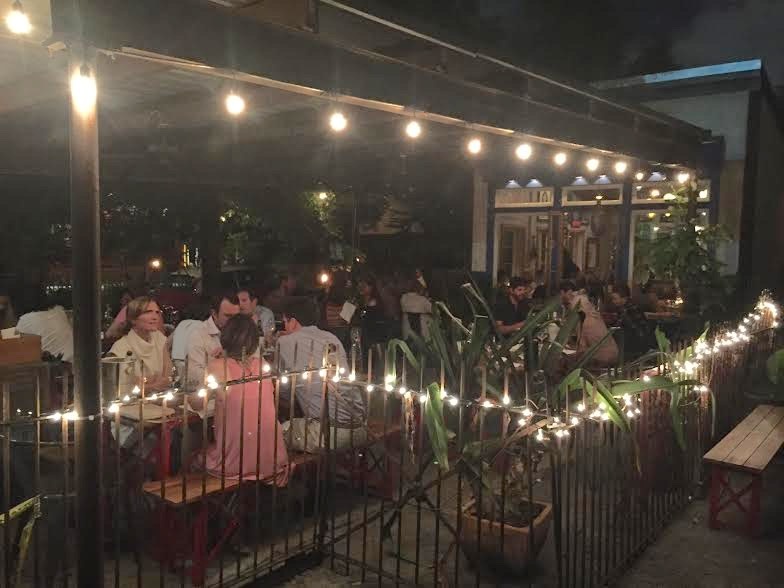 The hotel is conveniently located in the center of town, within easy walking distance of everything and features some lovely outdoor patios for relaxing or grabbing a bite to eat. If weather permits, take a swim in the pool or the lake. Bring a friend if you like. 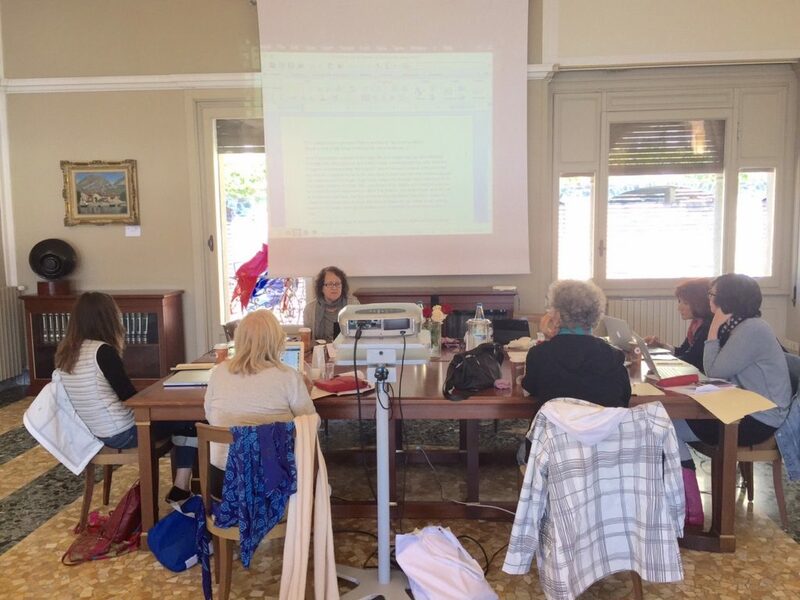 Not everyone who comes wants to write, and we have a discount for non-writing participants, although space is limited. More than anything, you’ll leave with the satisfaction of having made new connections with like-minded people, and you’ll have experienced the food, the culture and the environment of one of the most beautiful places on earth. 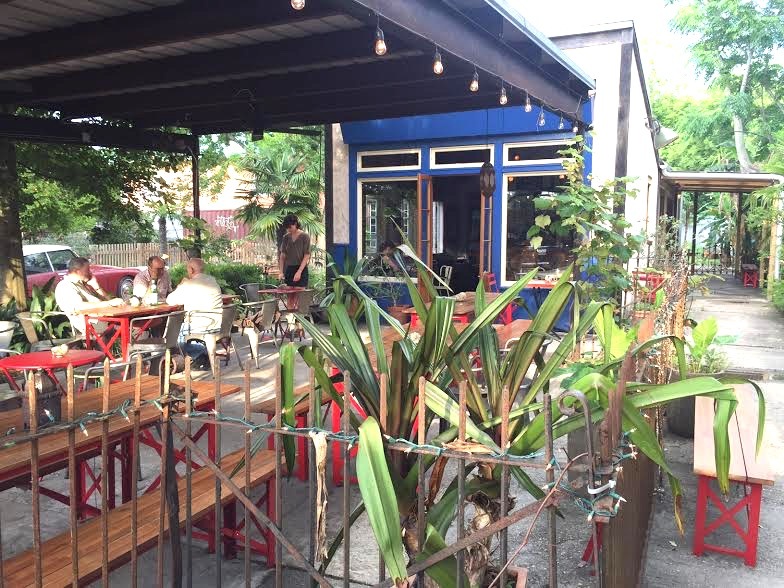 A trip to New Orleans is always difficult for a food lover. 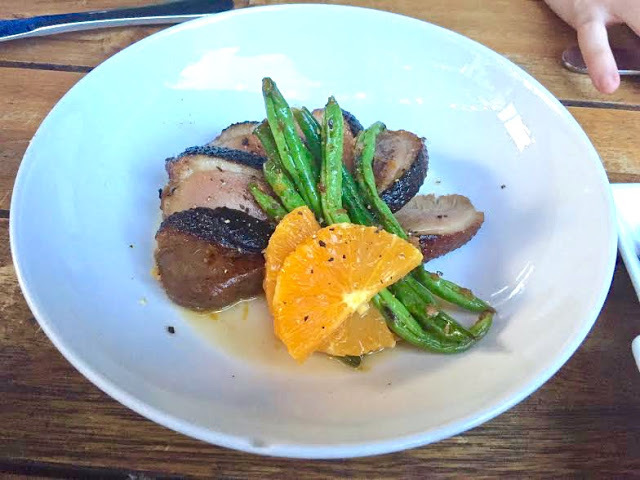 Difficult in a good way, because there are so many talented chefs in the Big Easy, offering wonderful options ranging from Creole dishes to traditional Southern favorites to nouvelle fusion. 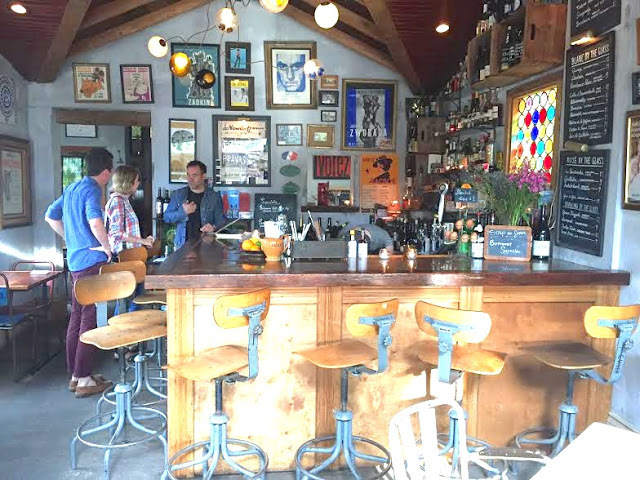 N7, labeled the country’s tenth best restaurant in 2016 by Bon Appétit magazine, fits the last description. 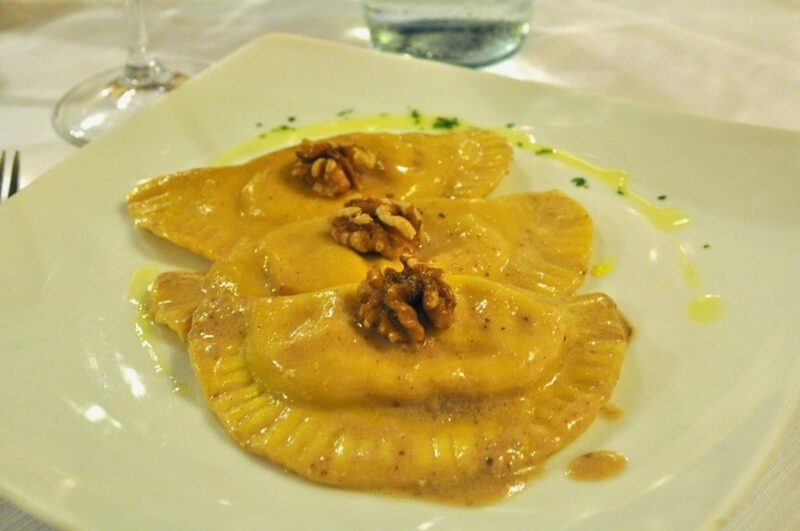 The food speaks with a definite French accent, and the restaurant’s name, N7, is a reference to the mythic road that ran from Paris to the border of Italy (now upgraded or replaced by the A77 autoroute). Finding your way along a French road that was the equivalent of America’s Route 66 might be slightly easier than finding the restaurant N7, tucked away on Montegut Street, off of St. Claude Avenue in the city’s funky, hip Bywater neighborhood. You might easily pass the entrance if you’re not looking for the red stenciled sign on a wooden doorway leading to N7’s courtyard. 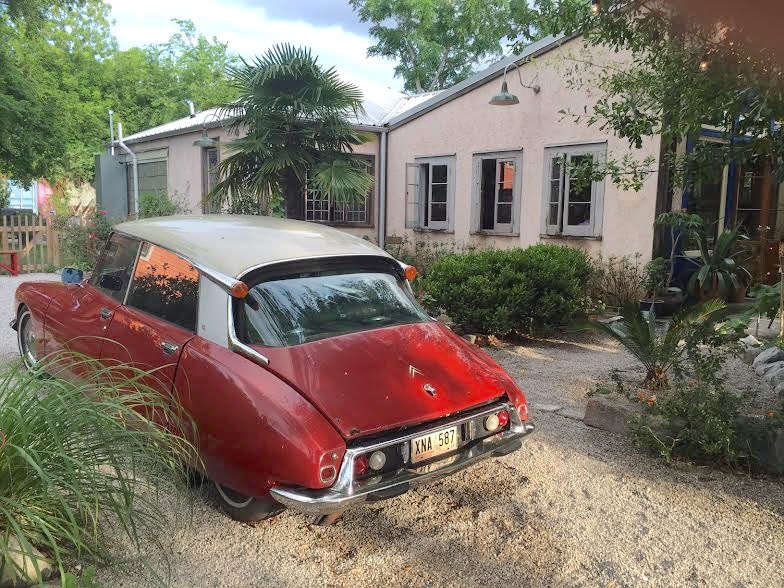 Once inside, you can’t miss the red Citroen taking a prime spot along the gravel driveway. Much of the seating is outdoors, in a courtyard outfitted with casual style tables and chairs, surrounded by potted plants and vines. But there is some seating indoors in a structure that at one time housed a tire shop, and long before that, a stable. 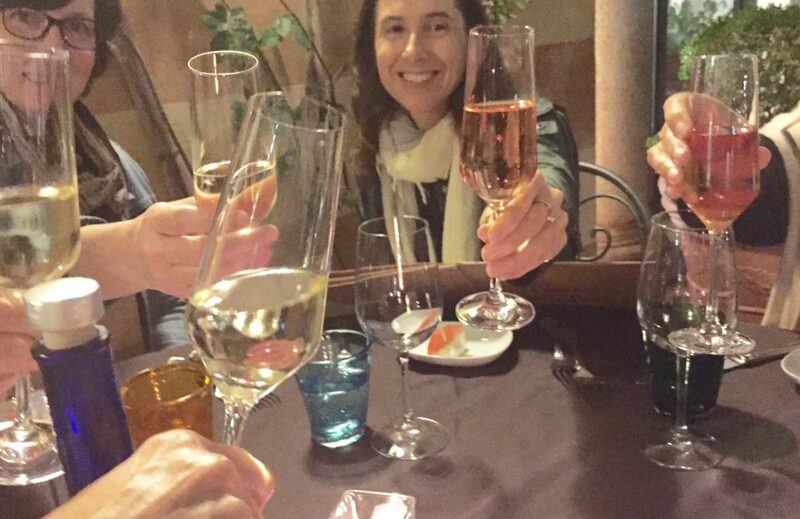 Sitting at the bar now though, you might be convinced that you were in a bistro in Paris’ Marais neighborhood. 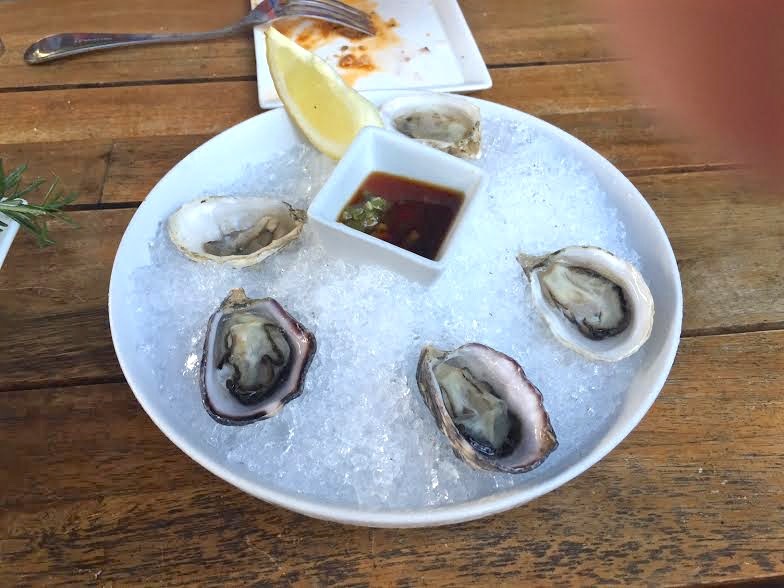 The food whispers with other culinary accents too, like the oysters from Washington State, served with a sauce redolent of soy sauce — not unusual since the restaurant is owned by Japanese born Yuki Yamaguchi, and her husband, filmmaker Aaron Walker. Nearly half the menu is “can to table” seafood – which could be off putting to many. 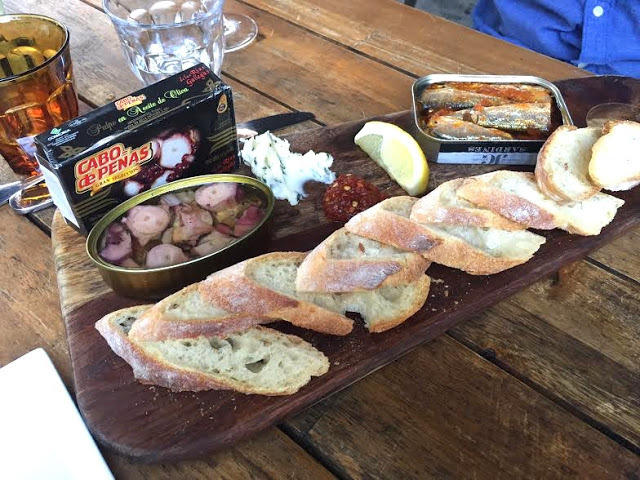 But in some European countries, particularly Spain, canned fish is a delicacy sought after as eagerly as fresh seafood. We dug in with gusto to the sardines, swishing our bread through the can to glob on to every last bit of the sundried tomato sauce. And after a squirt of lemon, the octopus in olive oil was gone in a flash too, accompanied by herb butter and a piquant red pepper paste. The menu, although limited, does contain a few cooked items, such as the seared scallops with chive oil, pictured in the first photo. It was our favorite dish of the night (recipe below). 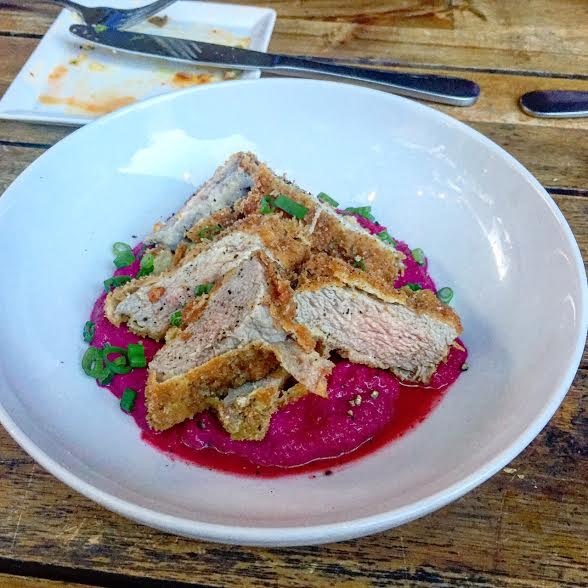 Another winner was the pork katsu with beet purée. The pork is dredged in flour, egg and finally panko (Japanese bread crumbs), then fried in hot oil and sliced. It rests on a luscious purée made with beets, apples, chicken broth and a little cream and yogurt. We also tried the duck breast a l’orange, again prepared with a hint of soy sauce in addition to the more traditional ingredients such as orange zest and orange juice. Desserts are very limited but seemed just right. Choose either French macaron cookies (not pictured) or the cheese plate, which contained three cheeses – a sweet gorgonzola, a sheep’s milk cheese and a creamy cow’s milk cheese. 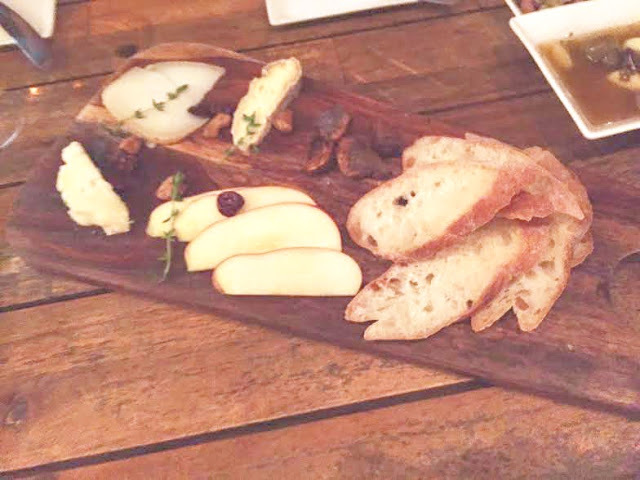 A few dried figs, cherries and nuts rounded out the platter. As night descended and the tables filled, lights twinkled around the perimeter of the courtyard. 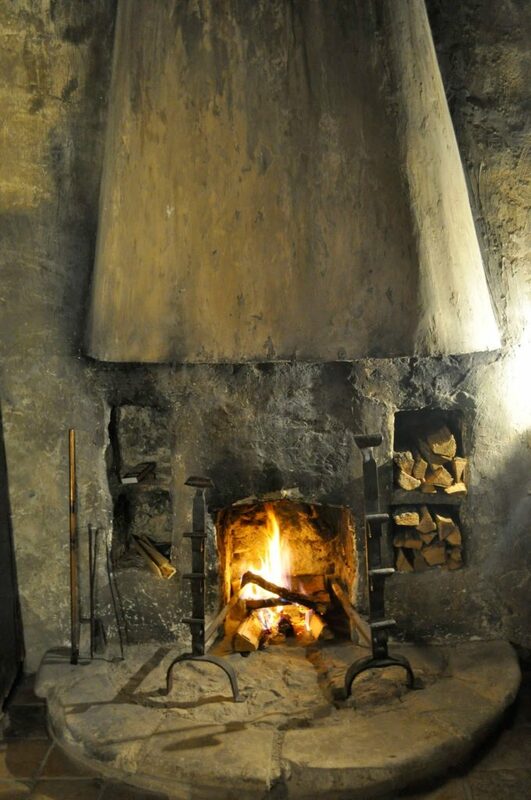 Is it really the most romantic French restaurant in the world, as Bon Appétit claims? 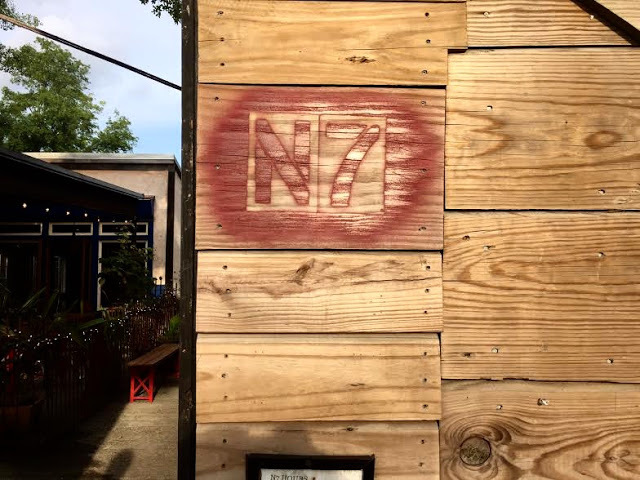 I’m not so sure I buy that moniker, but it sure won over our hearts and I know we’ll be visiting N7 again the next time we’re in New Orleans. 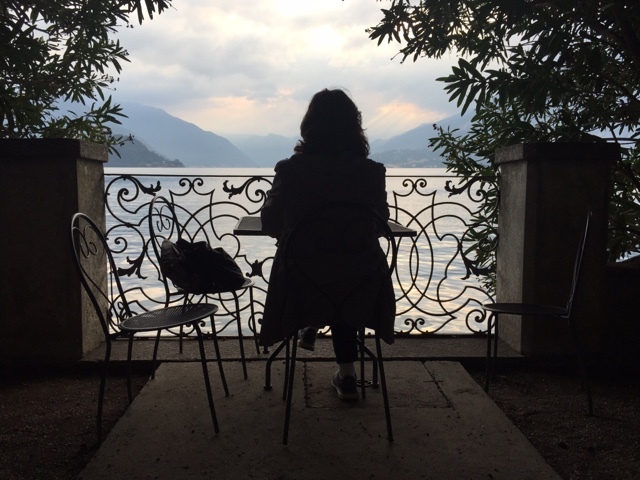 And if you’d like to take a real trip to Europe and a dreamy part of Italy, join me for a memoir writing retreat at Villa Monastero, in Varenna overlooking Lake Como. Only a couple of spots remain. You don’t have to be a professional writer to participate. Life is short, so don’t delay your dream. 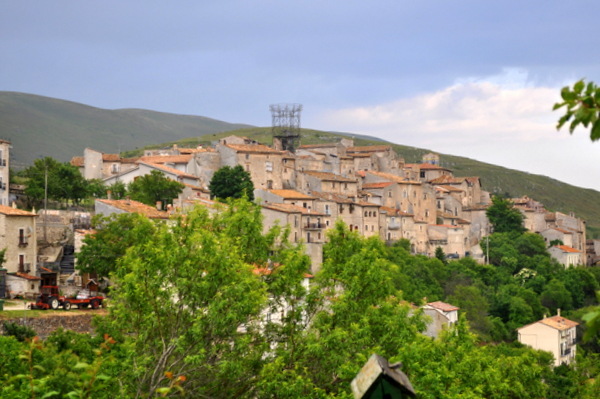 For more information, go to www.italyinotherwords.com or email me. Want more Ciao Chow Linda? Check out my Instagram page here to see more of what I’m cooking up each day. You can also connect with Ciao Chow Linda here on Facebook, here for Pinterest or here for Twitter. Purée garlic, chives, salt, and oil in a blender until smooth. Do Ahead: Chive oil can be made 1 day ahead. Cover and chill. Bring to room temperature before serving. mixture is smooth; season with salt and pepper. scallops dry with paper towels; season both sides with kosher salt. cooked through, about 2 minutes. Repeat process with remaining 1 Tbsp. 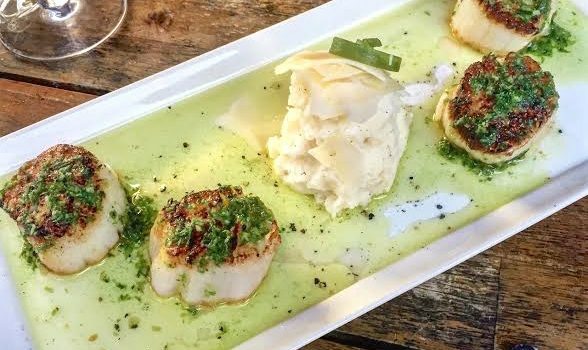 Top mashed potatoes with Gruyère and drizzle scallops with chive oil. 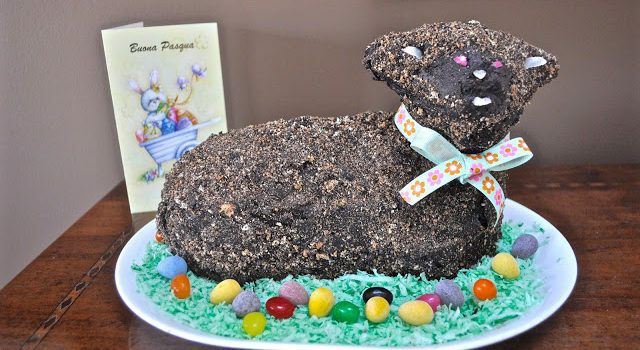 I wish I had thought to post this before Easter, because it would have made the perfect meal to serve on Fridays during Lent. But it still is a good one to keep in your back pocket for those nights when you want a meatless meal. 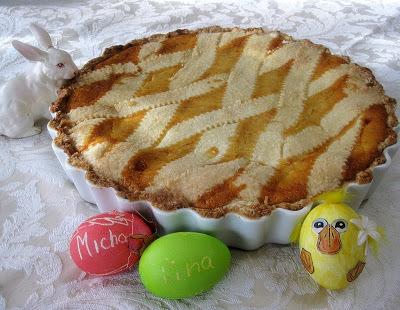 I made this using a store bought pie crust, making it easy to get on the table in a snap, but use your favorite homemade crust recipe if you have time. The recipe comes from “Blue Plate Special,” a memoir by Kate Christensen, read by my book group nearly a year ago. It’s a passionately written account of her unorthodox childhood and relationships as she navigates her way through adulthood. Through the sometimes painful, sometimes joyous, and frequently tumultuous events, food is the sustaining thread throughout. It’s well worth a read. Sauté the onion in the olive oil. Add the spinach, the herbs and spices. 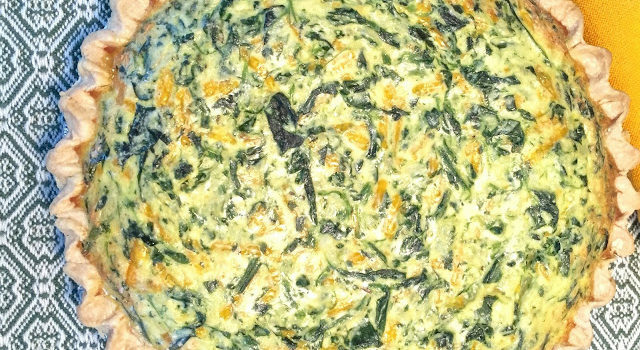 Beat the eggs, then blend in the ricotta cheese and the cheddar cheese, plus the sauteed onion and spices. Stir. 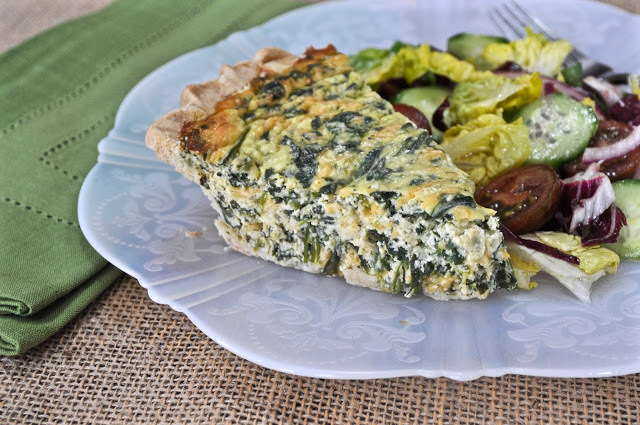 Turn everything into a store bought or homemade pie shell. Bake at 375 degrees for about 45 minutes until golden brown on top. 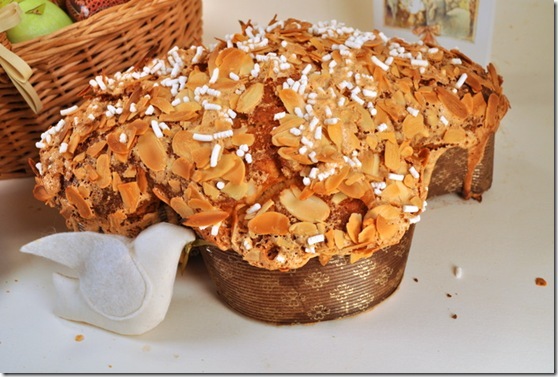 or the colomba, a rich, eggy brioche cake made in the shape of a dove that’s on every Italian’s dessert table at Easter. 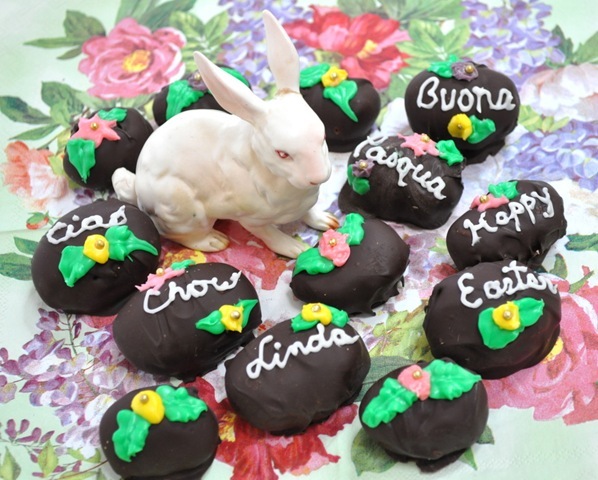 Once every few years, although it’s not an Italian tradition, I also indulge in making chocolate covered coconut cream Easter eggs. 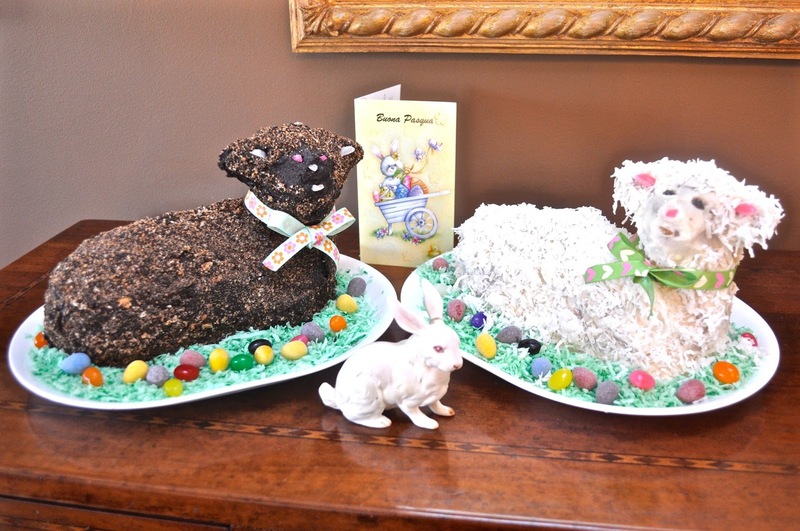 My mother-in-law used to make these (and peanut butter eggs) each Easter as a fund raiser for a local charity and they’re a real weakness of mine, but so much better than store-bought, especially when you use really good dark chocolate. But the dessert that holds the most memories for me is the lamb cake that my mother always made when I was growing up. It wasn’t the chocolate version, as seen in the first photo. 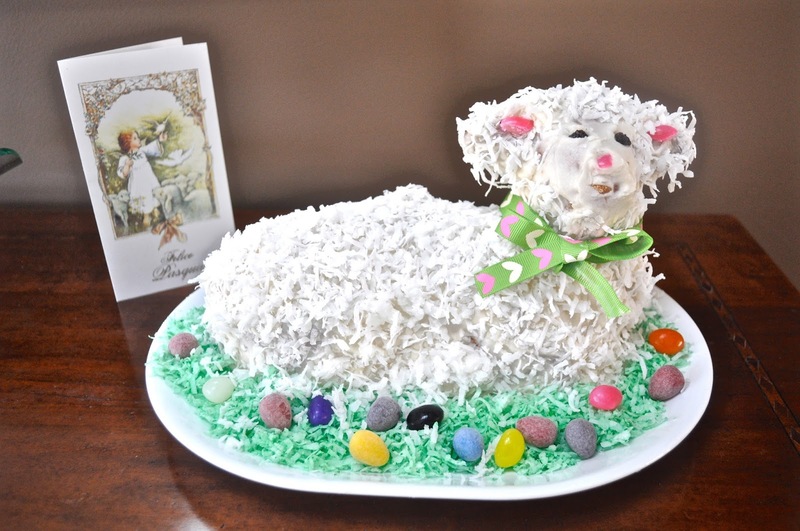 It was the white cake version, pictured below, that I often make each Easter. I’ve already written about the white cake version here, covered with buttercream and coconut, but since I attempted a chocolate version last year, I thought I’d show you the little brown lamb cake, and give you the choice of making either — or both. I thought for a while about what to use to simulate the dark fleece of a brown lamb, and I came up with this combination: ground up chocolate wafer cookies mixed with ground up amaretti cookies. 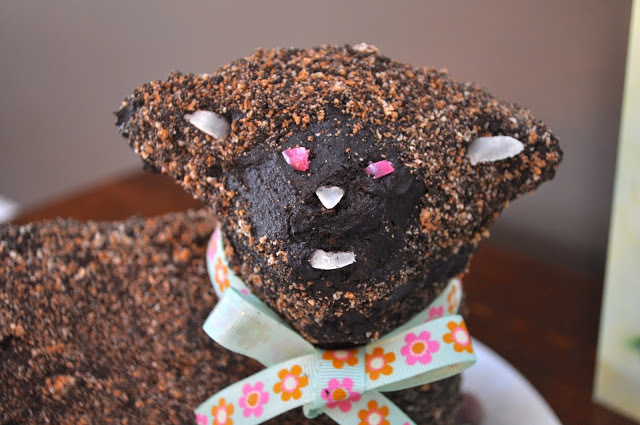 It tasted good and I think worked well as wooly fleece, pressed into the chocolate frosting. I used some cut up jelly beans for the eyes, nose, mouth and ear details, but if you have other ideas, I’d love to hear about them, or see a photo, so send it on. Don’t forget to tie a ribbon around its neck to dress it up in Easter finery. I inherited the lamb pans from my mother, but you can find them for sale in many places, including on Amazon.com. 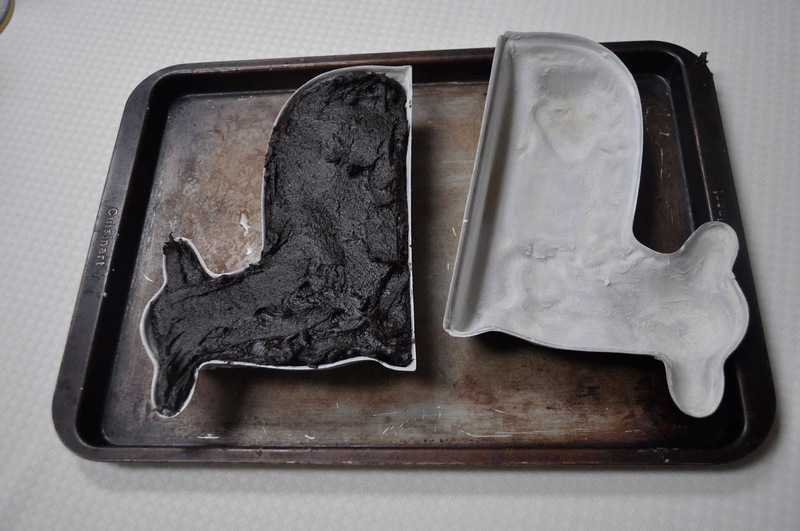 You fill only one side, then cover with the other very well greased half. I used a chocolate pound cake recipe I found online, and I knew there was more than enough for the lamb cake, so I baked the extra batter in some small, individual “cakelet” pans I had. Clearly, I loaded the pan with too much batter, since it started to leak out near the end of the cooking. No worries though. I just trimmed it up and proceeded with the frosting. This is how the chocolate cake looks before frosting. Don’t worry about the small holes you see here and there. I had to keep him company, so I made the vanilla version too. That recipe is here. Again, there seemed to be more batter than I needed, so I baked a couple of cupcakes too. 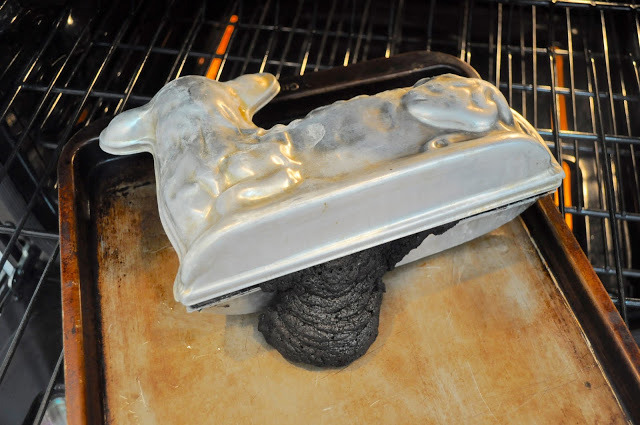 Make sure you grease the pan thoroughly, then dust with flour. After greasing with butter, and before flouring, I sprayed with some nonstick spray just for extra “insurance” against sticking. Following those instructions, I’ve never had a problem – not even with the small ear parts. 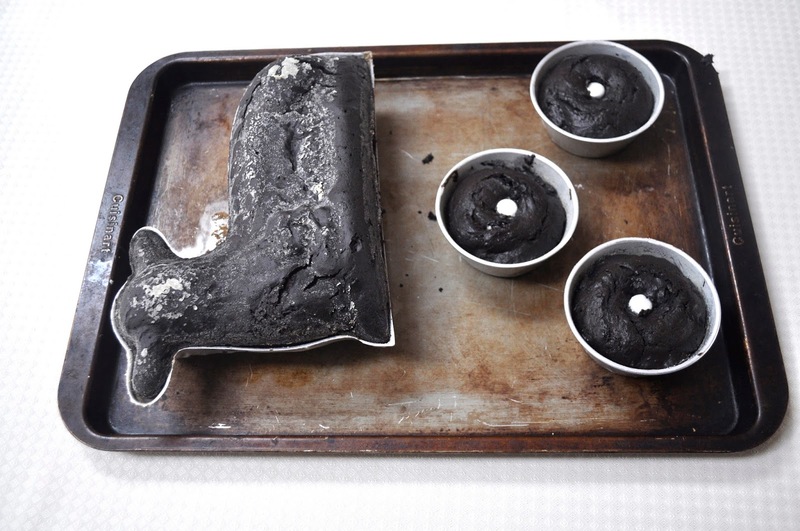 When you release it from the pan, it sits upright like this – in desperate need of frosting and decoration. Side by side, they make quite a cute pair. It’s almost a shame to cut into them. But we do — starting from the back end. By the end of the day, we were left with these decapitated heads. I can assure you they didn’t go to waste. Wishing all of you a happy Easter, or a Happy Passover, and if you don’t celebrate either of those holidays, Happy Spring to all of you. 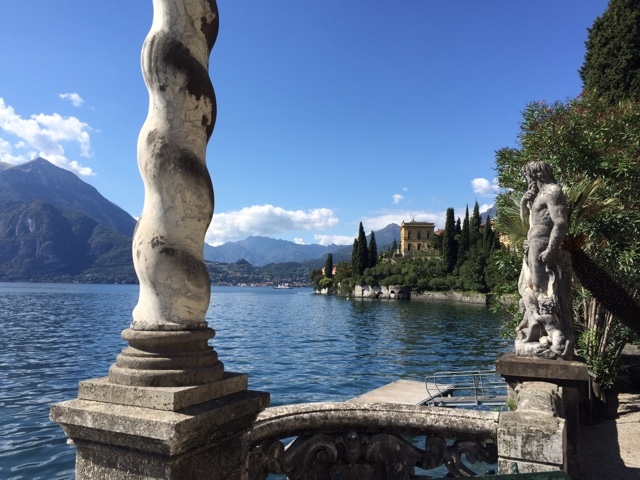 Let me also take this opportunity to let you know we have a few spaces left in our memoir writing workshop on beautiful Lake Como, Italy. 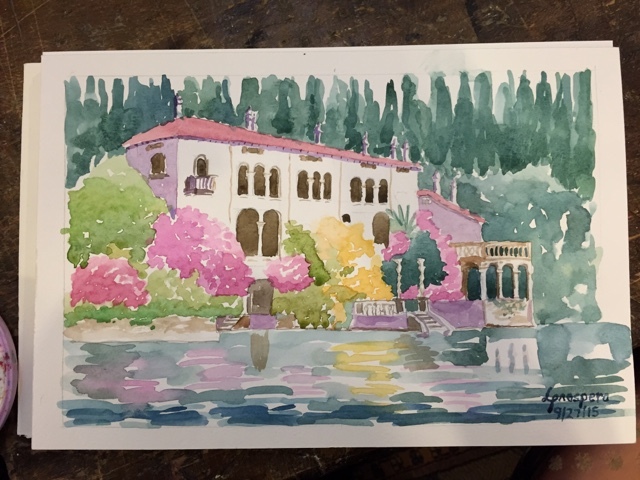 Your home away from home for a week will be Villa Monastero, in Varenna — open to tourists during the day who come to see the beautiful gardens here, but closed at night to everyone but our workshop attendees. Life is short – don’t postpone your dream. 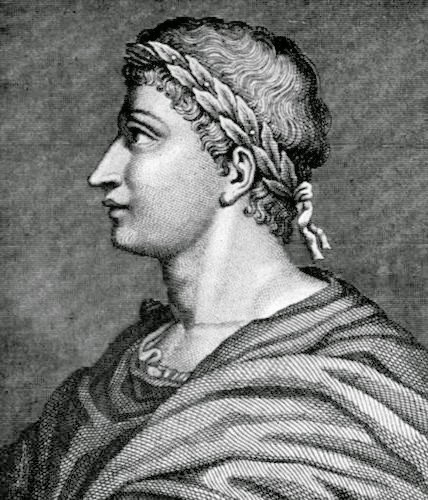 For more information, go to www.italyinotherwords.com. 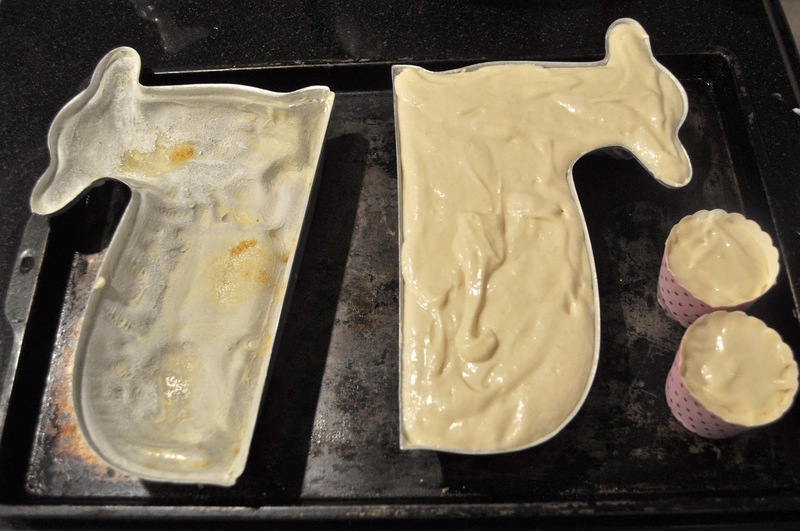 Grease and flour a 10″ fluted tube pan. 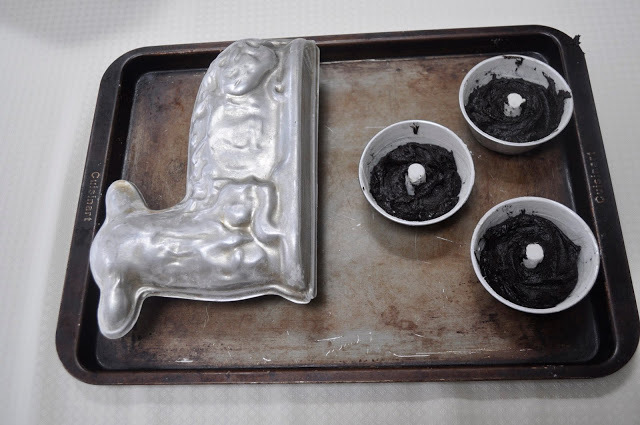 In a large bowl, whisk together the flour, cocoa powder, baking powder, baking soda, and salt; set aside. In another large bowl, using an electric mixer on high speed, cream the butter and sugar together until light and fluffy. Add the eggs, one at a time, beating well after each addition. In 3 additions each, beat in the flour mixture and sour cream just until combined. Bake for 60-70 minutes, or until the center tests done. Beat the butter in a mixer until smooth, then slowly add the rest of the ingredients until everything is blended to the proper consistency. If it’s too thick, add a little more milk. 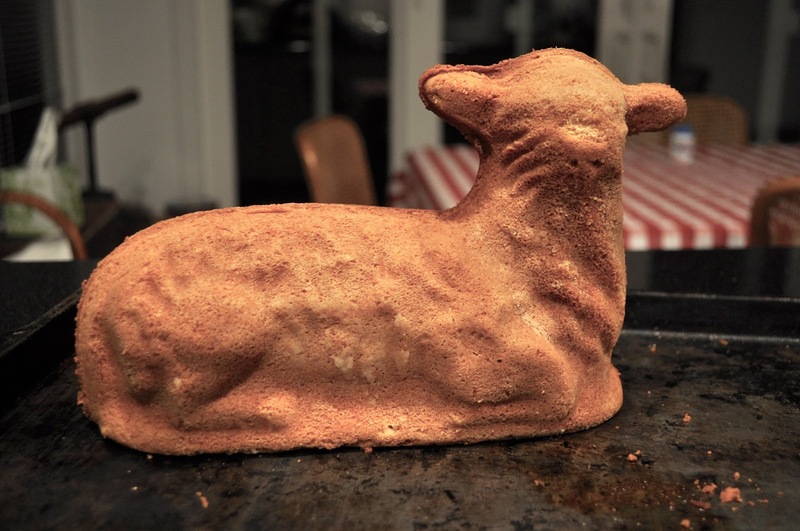 Spread over the lamb. You’ll have more than you need to coat the lamb, so freeze the extra. For the “wooly” coat:Buy some chocolate wafers and some amaretti cookies. Place some of them in a plastic bag and crush with a rolling pin (or pulse in a food processor until the proper texture). 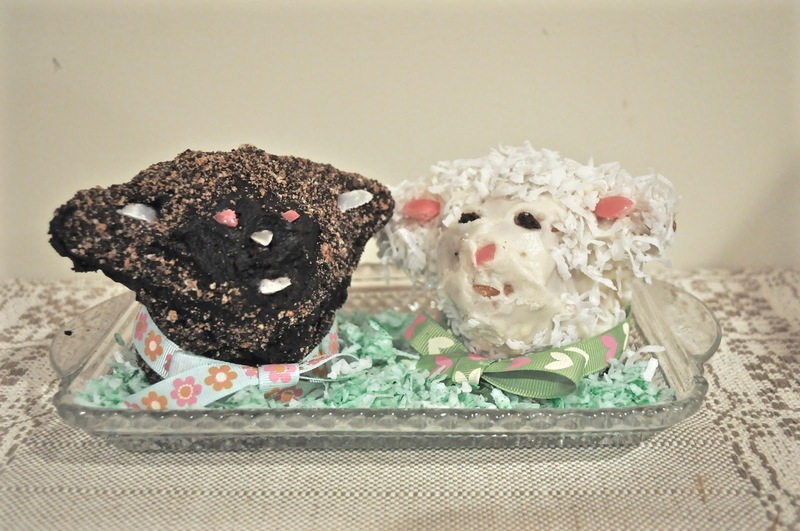 Using your hand, spread the cookie crumbs over the chocolate frosting, pressing in to secure.Decorate the eyes, ears, nose and mouth with bits of jelly beans or other candies. 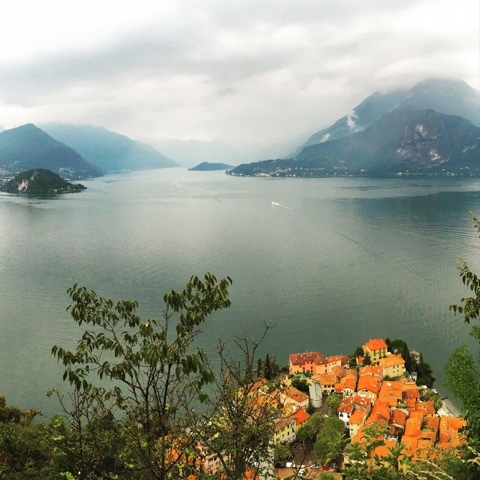 Join me for a week on Lake Como, to write about that childhood memory, travel experience, or any other event you’ve been wanting to capture in print. Spend the mornings in writing instruction, and afternoons in leisure touring the area, eating exquisite foods and pinching yourself that it’s real. 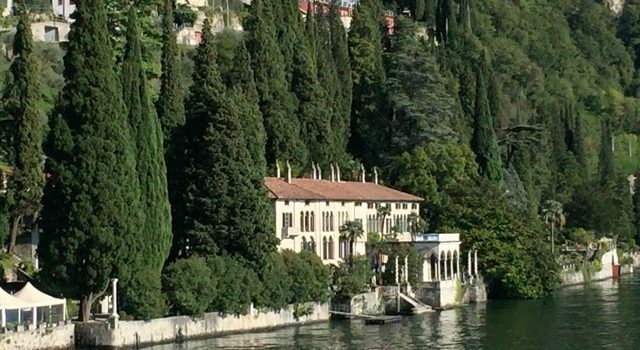 Kathryn Abajian and I hold the writing retreat at Villa Monastero (pictured above) in Varenna, on the banks of Lake Como, Italy. We’re scheduled to repeat it September 24-30., 2017. 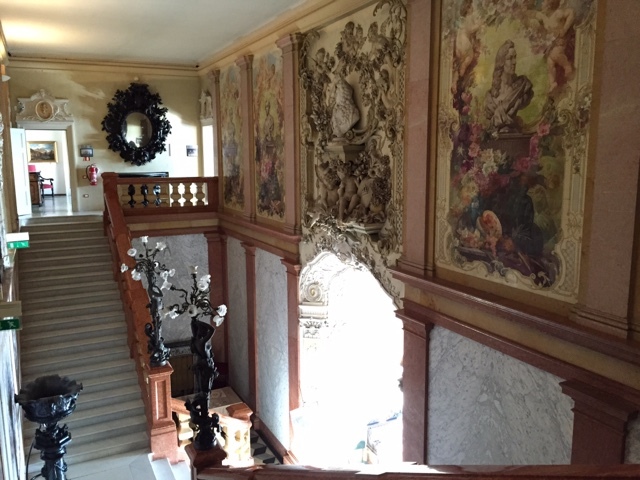 Come along with me for an armchair visit to learn about the villa and its origins. Maybe you’ll decide you’d like to spend a week here with us too, improving your writing skills, and partaking of the region’s foods, wines and nearby sights. 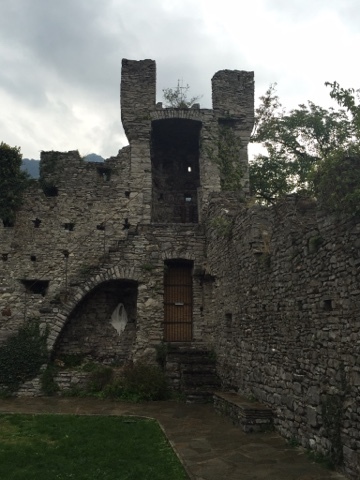 The villa was founded as a Cistercian monastery in 1208, but its mission foundered in 1667, when the nuns left for Lecco, a city to the south. 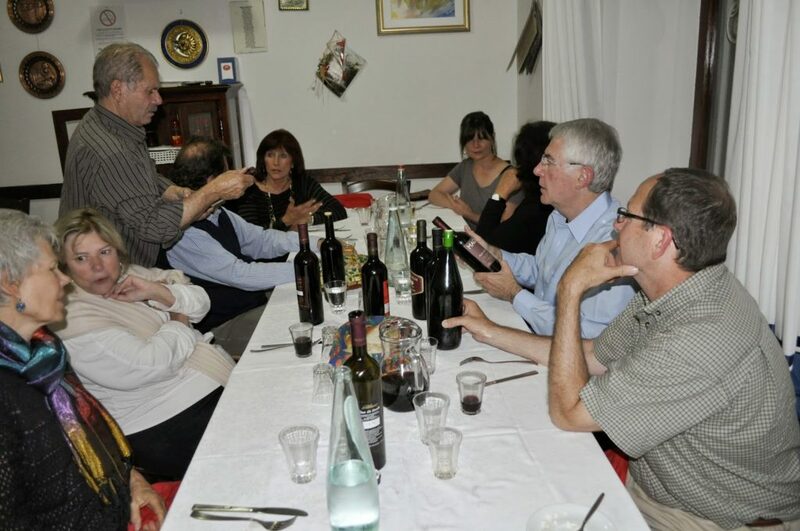 After three years, the villa was sold to the Mornico family, whose weath came from the iron mining industry in the area. 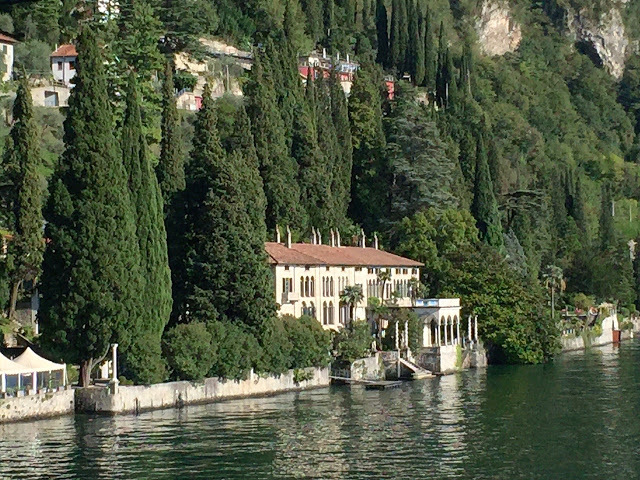 The family converted the monastery to a noble residence, renaming it Villa Leliana. 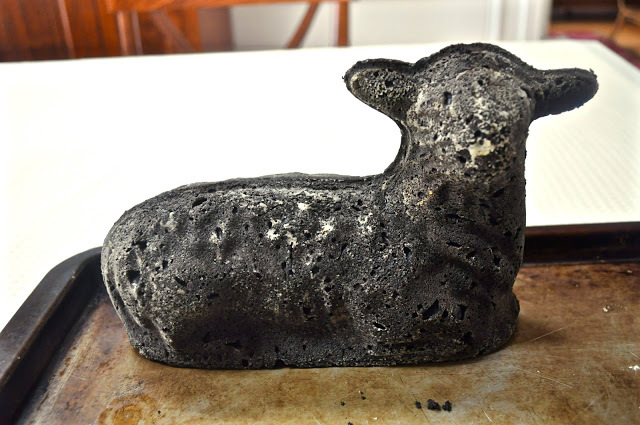 It was held by the Mornico family for nearly three centuries, when it was sold at the end of the 1800s to the German sheep owner Walter Kaas. But in the lead up to World War II, Kaas was declared an enemy of the state and was sent back to Germany, while Italy took over the villa. 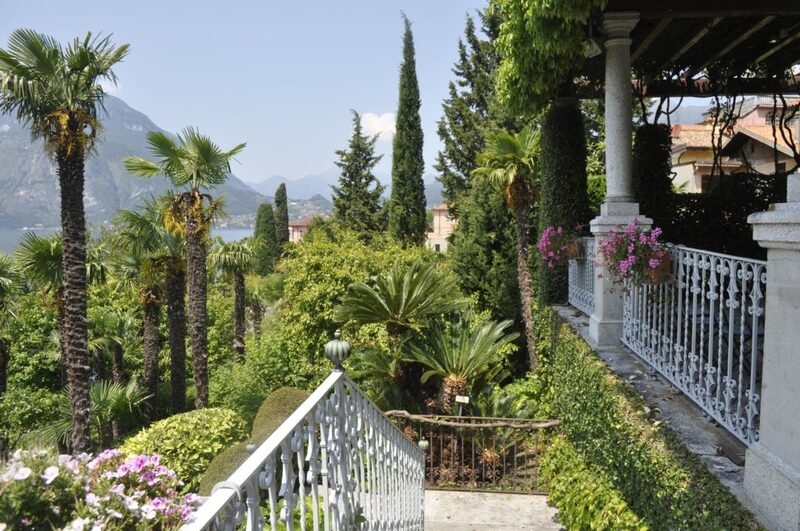 The villa was then used by the elite mountaineering unit of the Italy military called the Alpini, until it was sold in 1955 to biologist Marco de Marchi, who converted the villa into a scientific conference center. 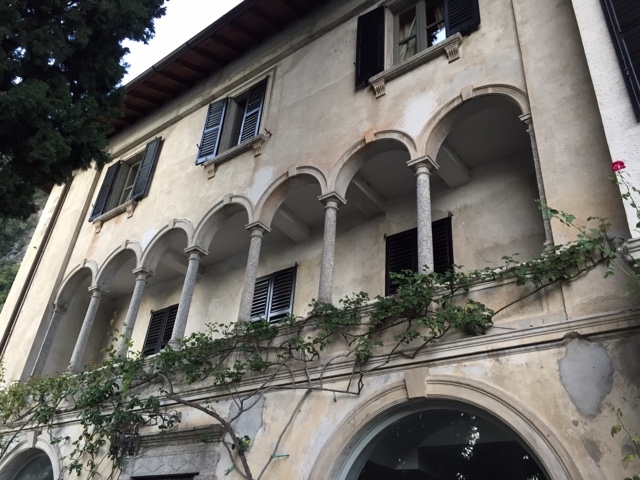 Marchi had no heirs however, and left the villa to the Italian government with the proviso that it be used for conferences of a scientific or artistic nature. We hold daily sessions in a sun-filled conference room overlooking the lake, surrounded by beautiful artwork created by local artists. 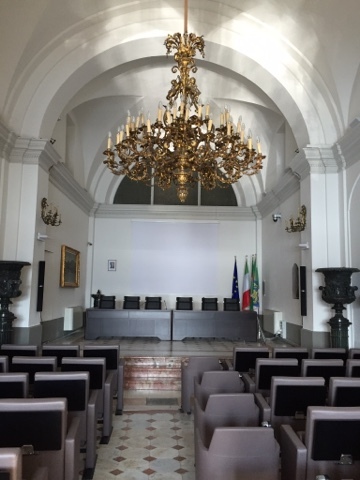 The villa also has a larger conference room that served as a chapel when the nuns occupied the villa, and is the place where Nobel prize winner Enrico Fermi taught his last lesson. 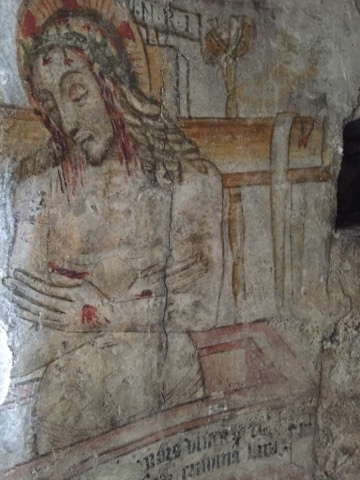 You can see evidence of a religious fresco is a small niche there, dating to the 13th century. 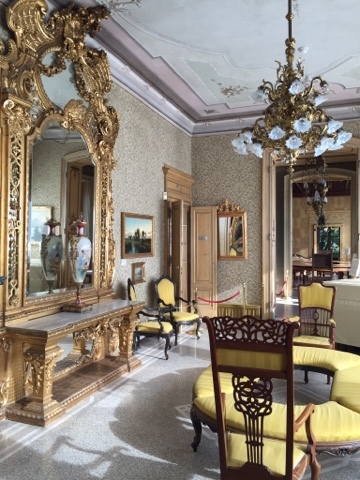 Other rooms in the villa highlight both the Germanic artistic taste of Walter Kaas, as well as highly decorative furnishings bought by de Marchi. 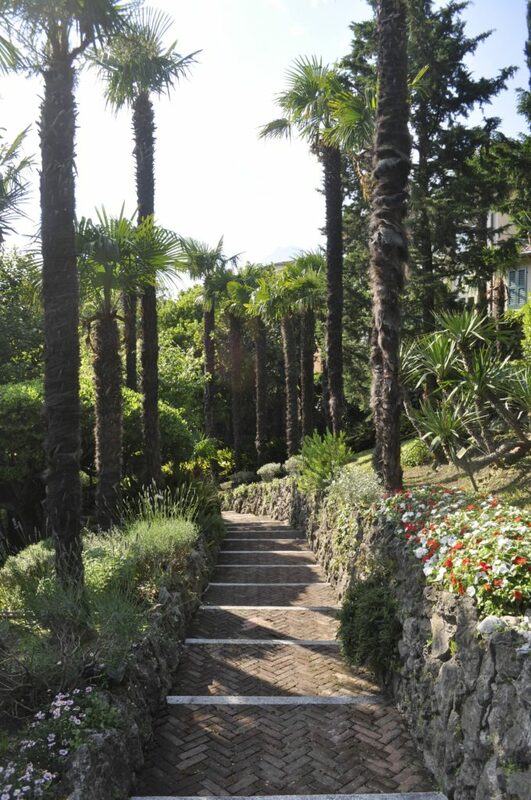 The villa’s extensive gardens, containing thousands of species of plants, are open to the public, but at night, we writers have the beauty of the grounds and the silence of the lake to ourselves. Most bedrooms have modern furnishings, some with views of the lake, and a few have balconies facing the lake. Sign up early to get priority for one of these. 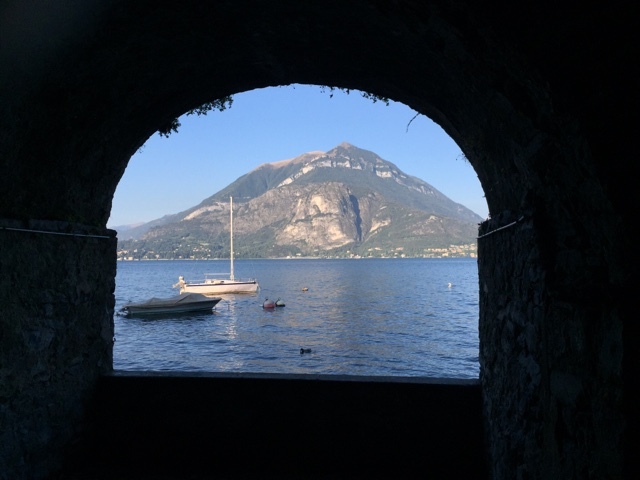 Writing instruction is in the morning, and you can set up your laptop by the lake in the afternoons to soak in some inspiration from the peaceful and lush surroundings. 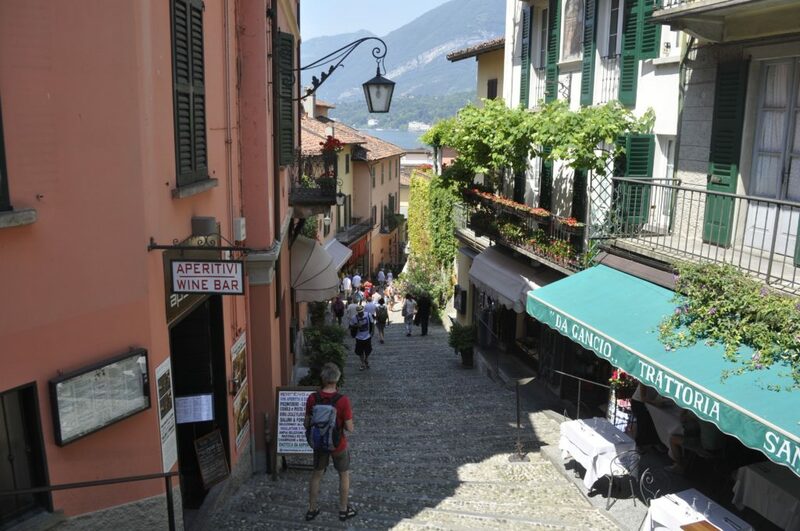 If you need a break from writing, the town of Varenna has a lot to offer, with inviting shops and cafes. 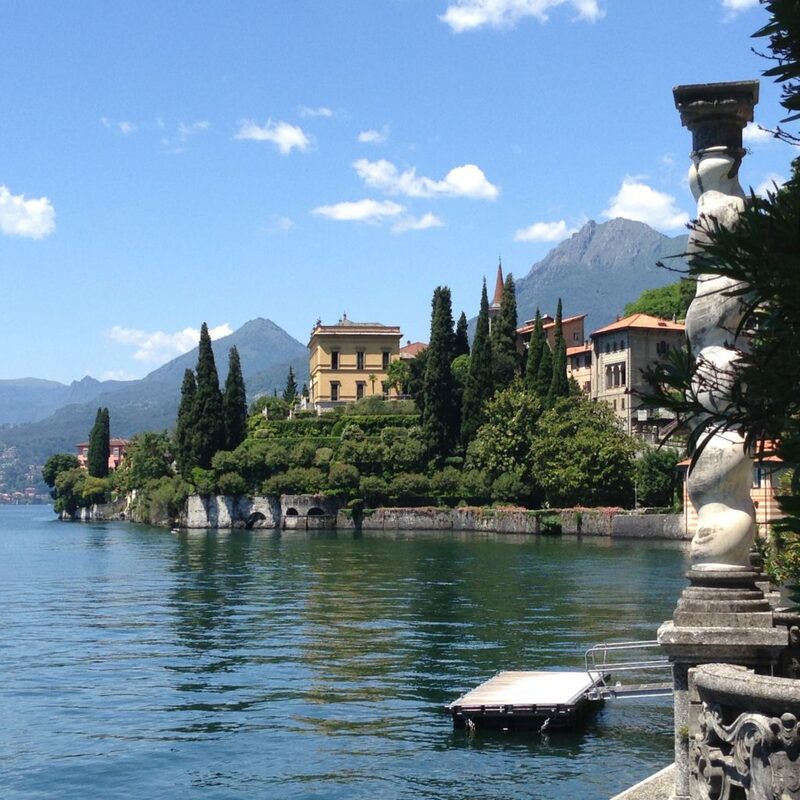 Can you picture yourself seated along the lake sipping a cappuccino, or a glass of Prosecco? 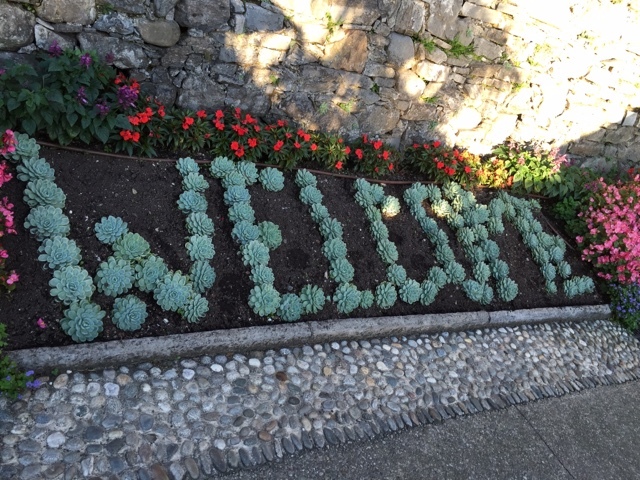 Come with us if you like, on an afternoon visit to Vezio, and step back to the 11th century and a castle that was once home to Teodolinda, queen of the Lombards. 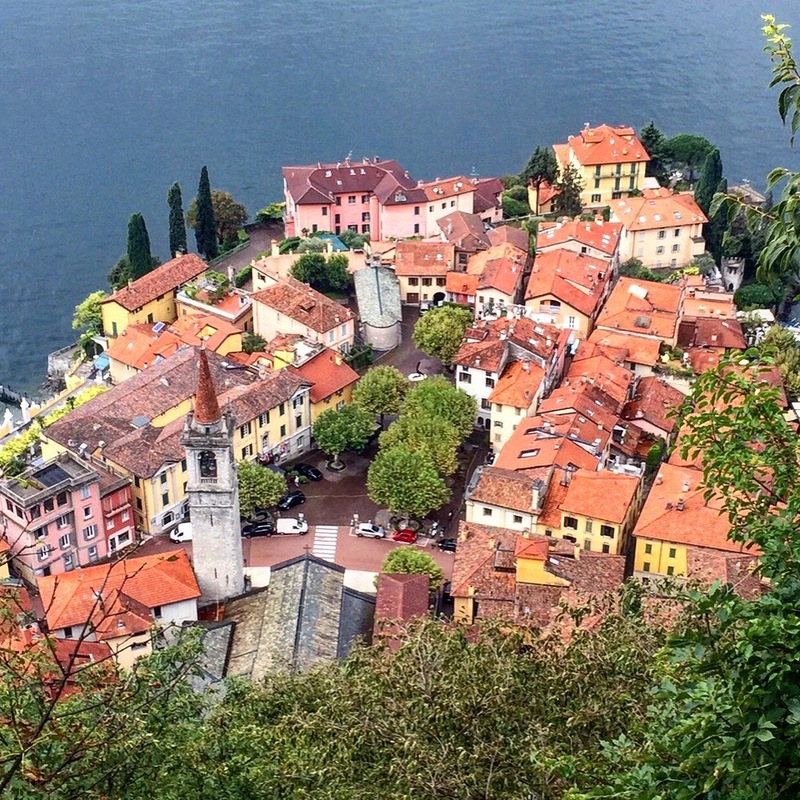 From the castle, you get a magnificent view of the lake and the rooftops of Varenna below. 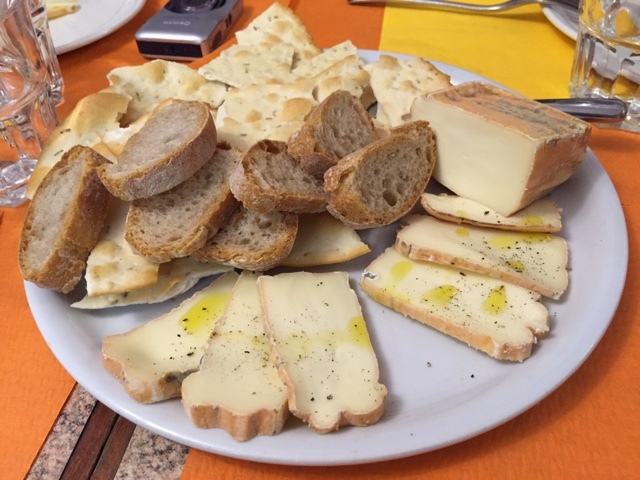 We also eat well on our retreats, and taste local wines and cheeses, like this taleggio. 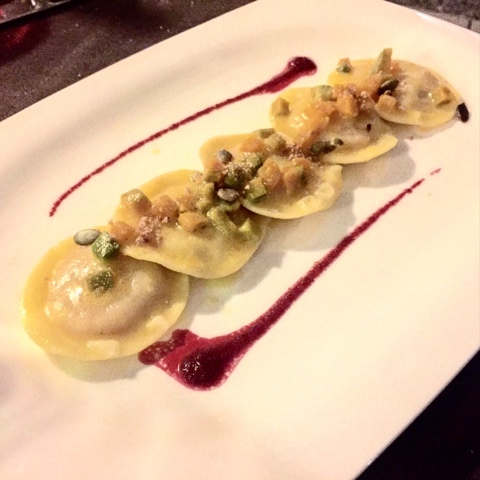 Dinners are all special, and we try different restaurants each night. 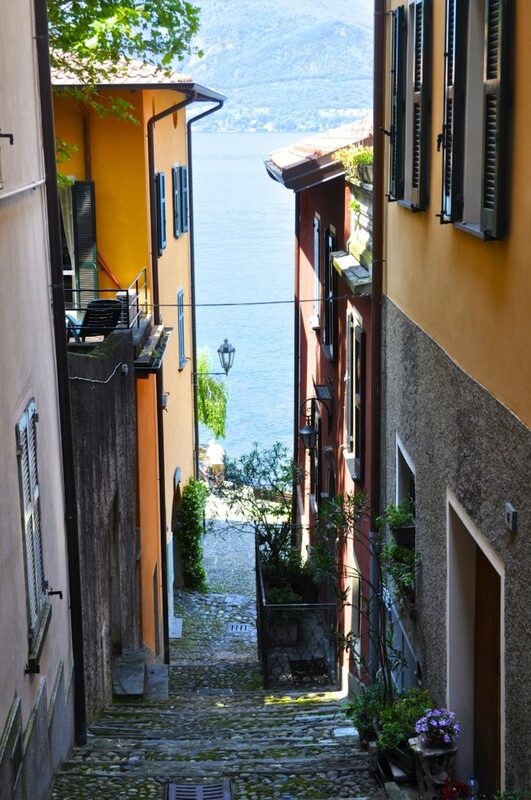 If you’d like to go further afield one afternoon, we’ll take you on the ferry to Bellagio, where the streets are as quaint as the shops are prolific. You can even try your hand at watercolor, whether you’ve got experience or not. We can arrange a lesson for you. 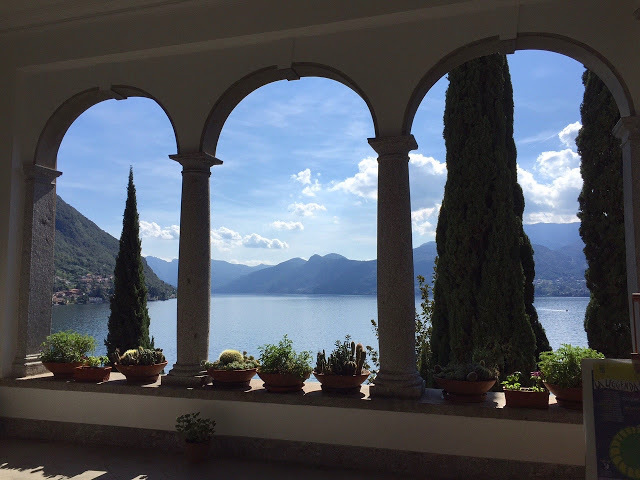 It’s not to soon to start thinking about reserving a spot for next year’s retreat at Villa Monastero – September 24-30, 2017. 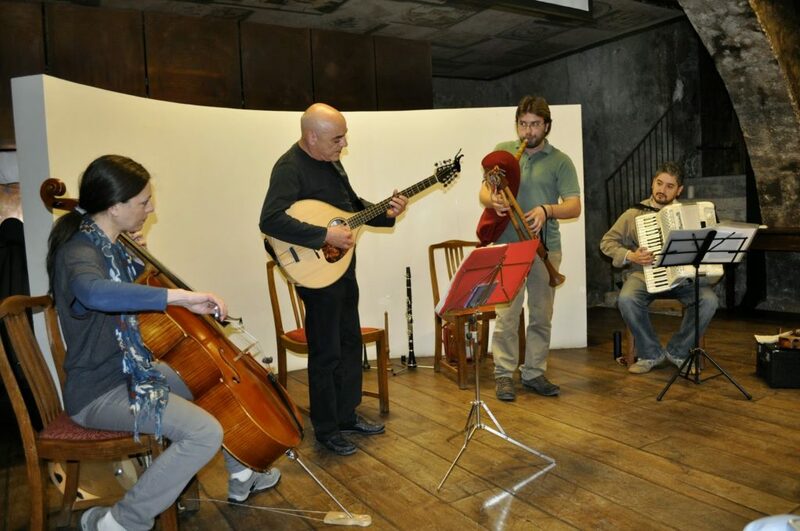 Check out our website at www.italyinotherwords.com for more details. How many times have you heard the phrase “Life is short?” Well, it’s not just a saying, it’s true. It’s a week you’ll never forget. 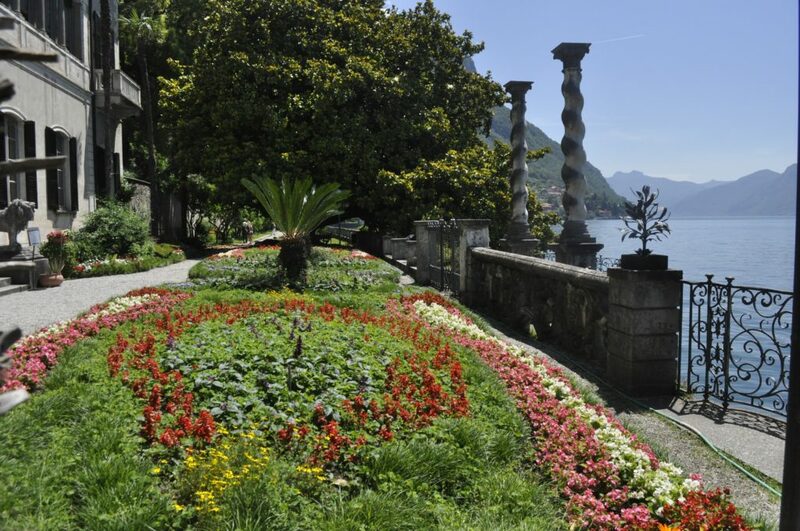 Villa Monastero is a beautiful villa surrounded by magnificent gardens, located in Varenna, on the banks of Lake Como, Italy. It’s also the place where Kathryn Abajian and I held our writing retreat last month, and where we’re scheduled to repeat it next year. 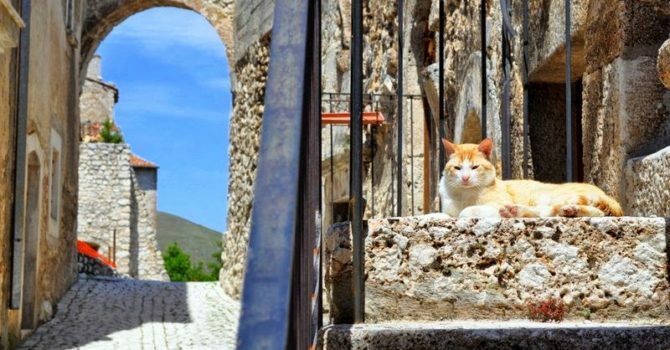 Come along with me for a visit to learn about the villa and its origins. Maybe you’ll decide you’d like to spend a week here with us too, improving your writing skills, and partaking of the region’s foods, wines and nearby sights. Marchi had no heirs however, and left the villa to the Italian government with the proviso that it be used for conferences of a scientific or artistic nature. 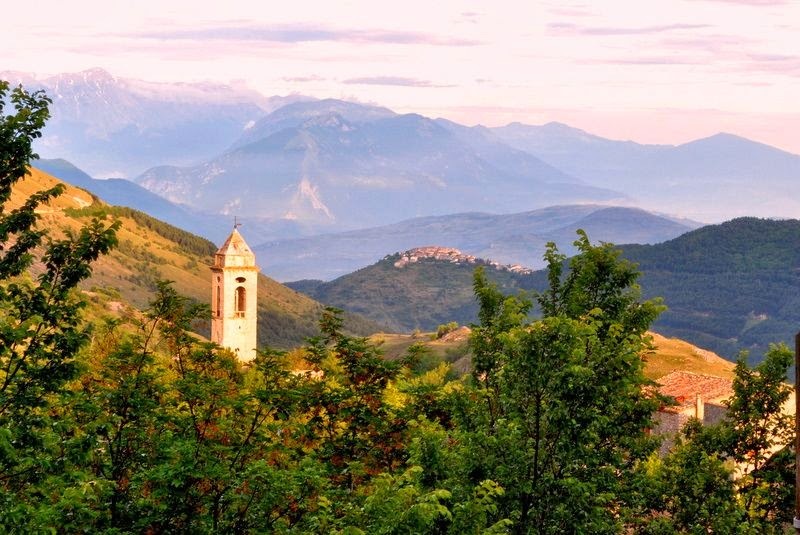 This year, we received approval to hold our writing retreat, “Italy in Other Words” at Villa Monastero, after conducting it in Abruzzo for the last several years. 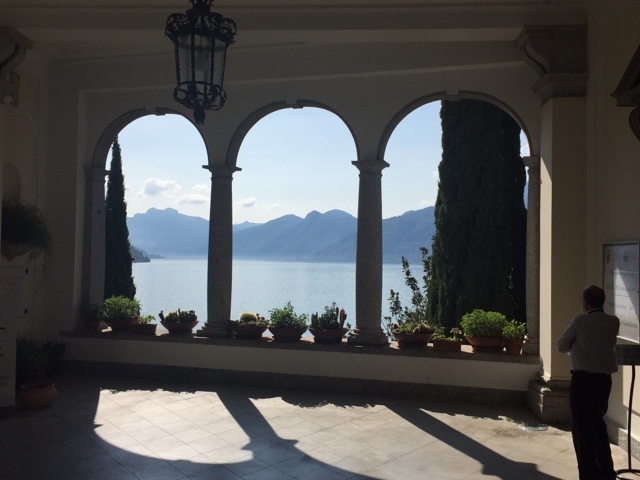 It may seem early, but it’s not to soon to start thinking about reserving a spot for next year’s retreat at Villa Monastero. We plan to hold it from September 18-24, 2016. 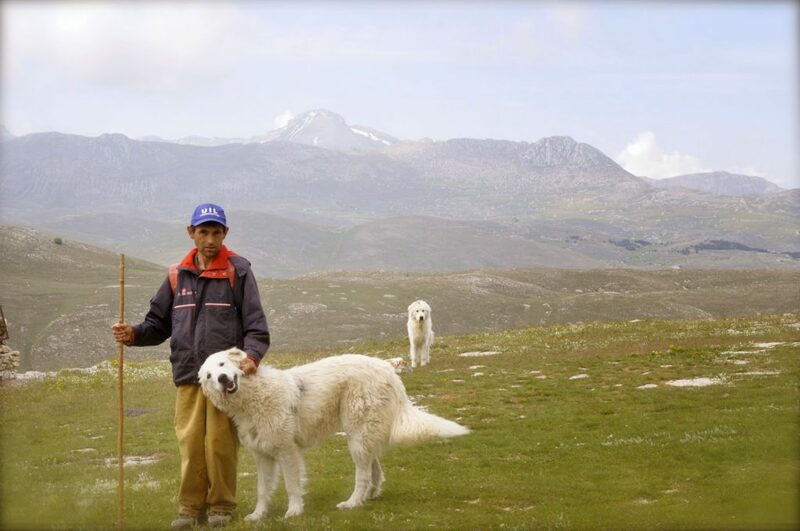 Check out our website at www.italyinotherwords.com for more details. People sometimes ask me where I get my inspiration for the recipes on this blog and the answer is, it comes from various sources, like family recipes, meals I eat in restaurants, and from other food bloggers. 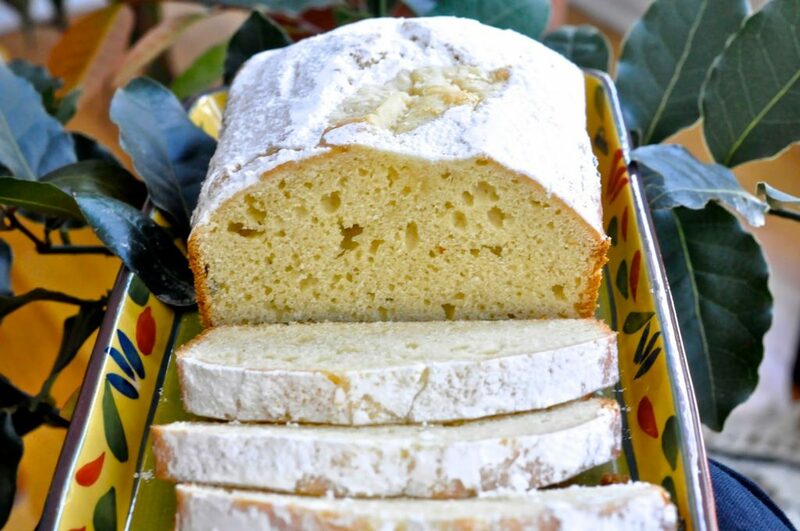 In this case, it came from Roz, who writes a wonderful blog called “La Bella Vita Cucina”. She lives in South Carolina, but has family in Emilia Romagna, the same region where my mother was born and where I still have relatives. 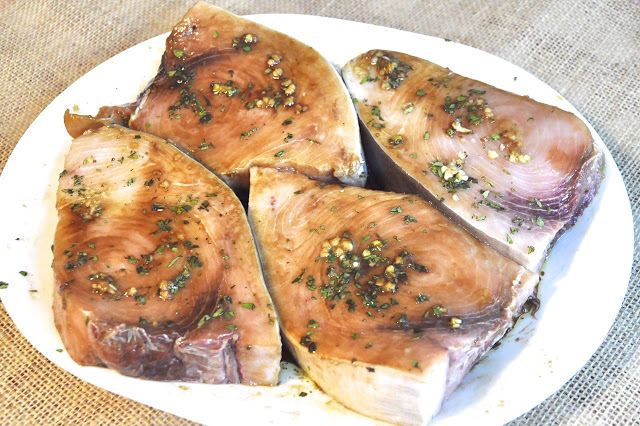 Swordfish is one of my favorite seafoods but it’s frequently overcooked by home cooks. It doesn’t take long before it’s dried out and tasteless. Roz’ instructions to grill it for two minutes on each side are spot on. The fish will be perfectly moist and tender. Roz’ recipe calls for smearing olive oil over the swordfish, but I also brush on some soy sauce, grated garlic and minced thyme. Let it sit for a few minutes, then dredge it in the bread crumbs and grill. Don’t worry if some of the breadcrumbs fall off on the grill. You’re bound to lose some, even if you grease the grates. The delicious lemon caper sauce covers up any spots that stuck to the grill, and delivers such a flavor punch, you’ll be tempted to lick the plate. 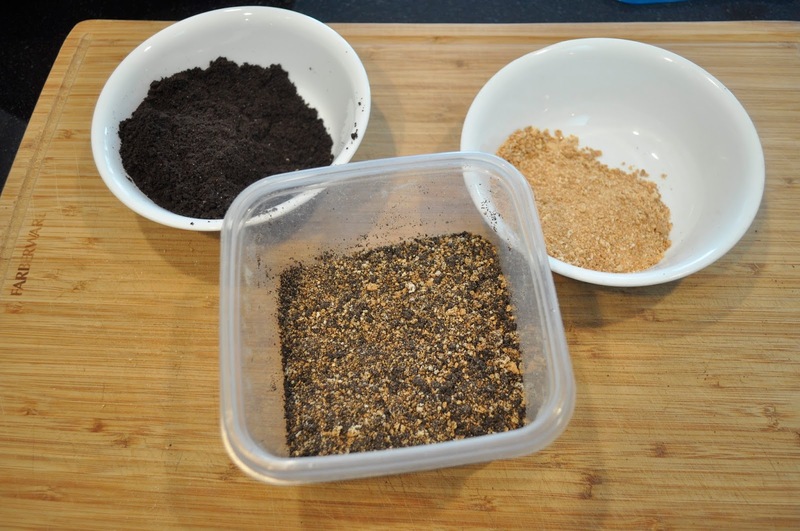 Using a shallow mid-size bowl, pour in the Italian seasoned bread crumbs and panko crumbs. 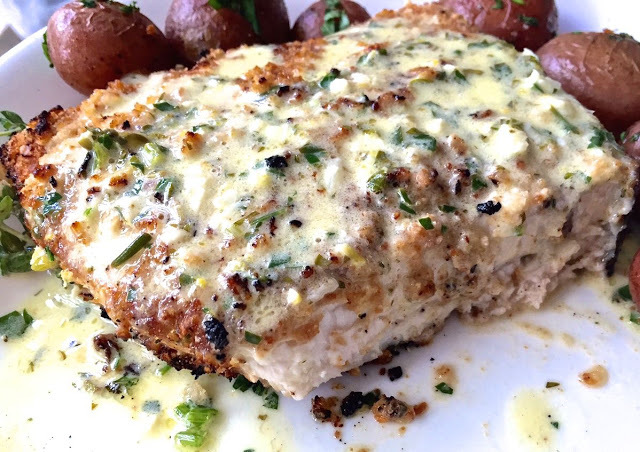 Place each oiled swordfish steak onto the bread crumbs and panko crumbsand then turn over, making sure that the steak is covered on all sides. While grill is warming up, heat all of the sauce ingredients in a saucepan. 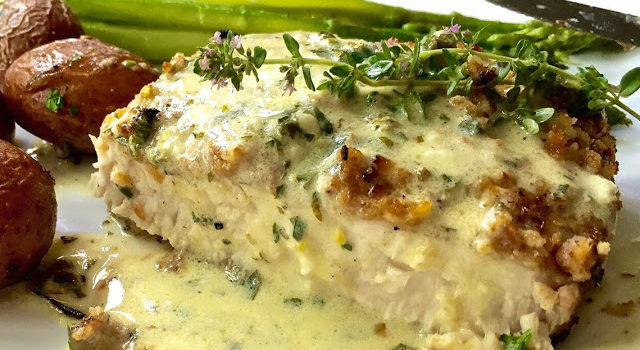 Place on a very low simmer to keep the sauce warm while grilling the swordfish steaks. Grill the steaks on a medium-low heat for 2 minutes on each side until the bread crumb coating is a nice gold-brown color. The thicker the steak, the longer the time necessary to cook through, keeping in mind that the steaks should not be cooked to the point of being dry, but rather they should be moist and tender inside. Pour a little bit (about a tablespoon) of the creamy lemon caper sauce on top of each steak. 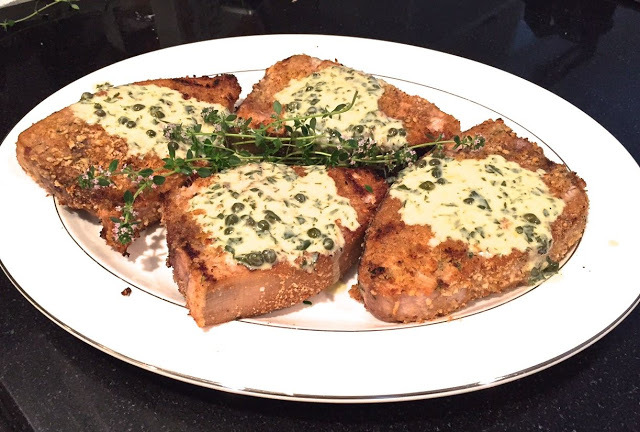 Garnish with sprigs of fresh-cut Italian parsley and slices of lemons. Pass the remainder of the sauce around to guests. Bay leaves are one of the unsung heroes on the spice/herb shelf. They sit there in jars turning paler and paler with each passing year, and find their way into the occasional stew or soup. When they reach that point, where they’re insipid in taste, it’s time to throw them out and buy new ones. 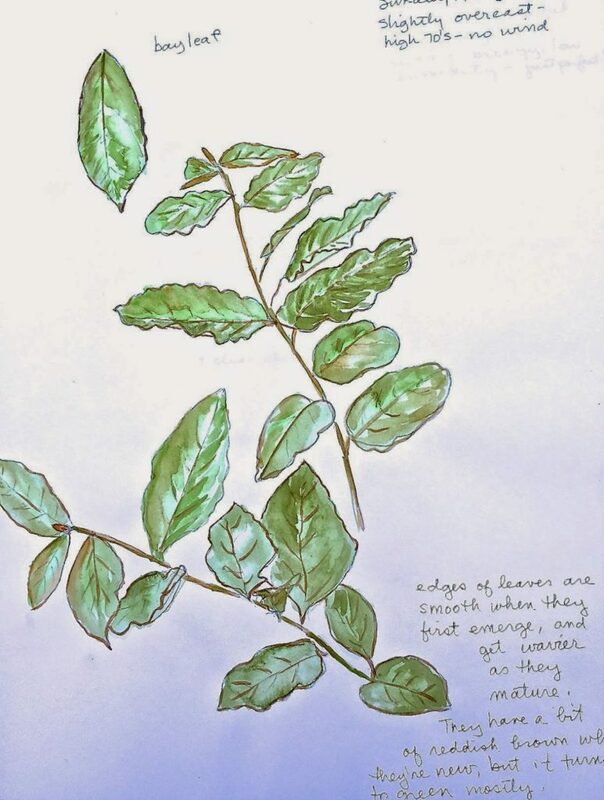 I’ve had a fascination with bay leaves since the year I lived in Italy, where I encountered hedges of bay leaf plants everywhere, tempting me to pluck a leaf or two whenever I needed it for a recipe. If you’re in Italy during college graduation season, it’s common to see newly minted graduates around town wearing laurel wreaths encircling their heads, a tradition started at the University of Padua, one of the world’s oldest universities. 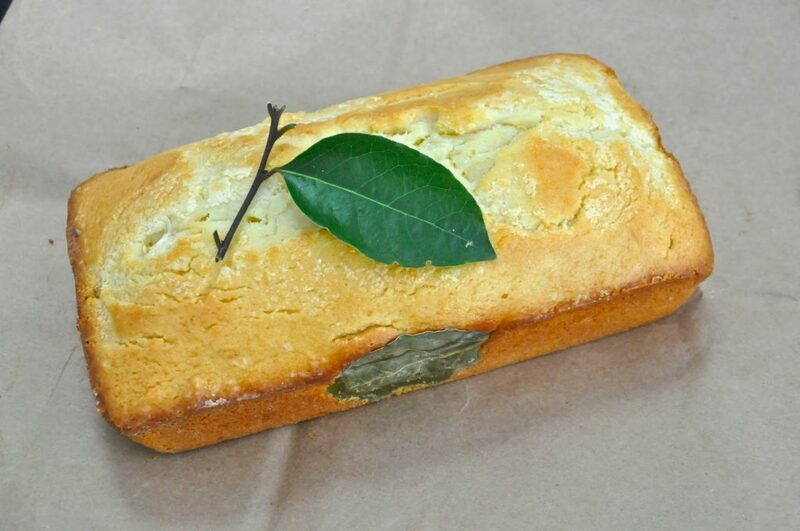 I have used some of the leaves in the past for a wonderful appetizer with ricotta cheese, but when I saw this bay leaf pound cake from David Leibovitz’ “My Paris Kitchen,” I knew my now thriving, four-year old bay leaf plant was in for a pruning. 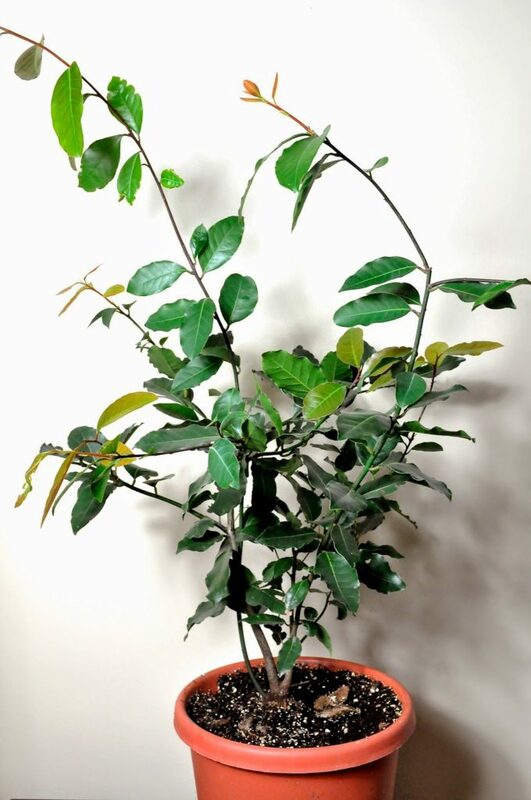 There are at least two types of bay leaf plants by the way – California and Turkish. What you find in spice racks at grocery stores is mostly the dried Turkish variety. Each of the varieties is highly aromatic, but from what I’ve read the Turkish, or Mediterranean variety (my plant) has a subtler flavor, with floral overtones. Some sites even claim that the California bay leaf has a “medicinal” taste and is more suited to making wreaths (or crowning Olympic champions) than to culinary purposes because of its strong flavor. 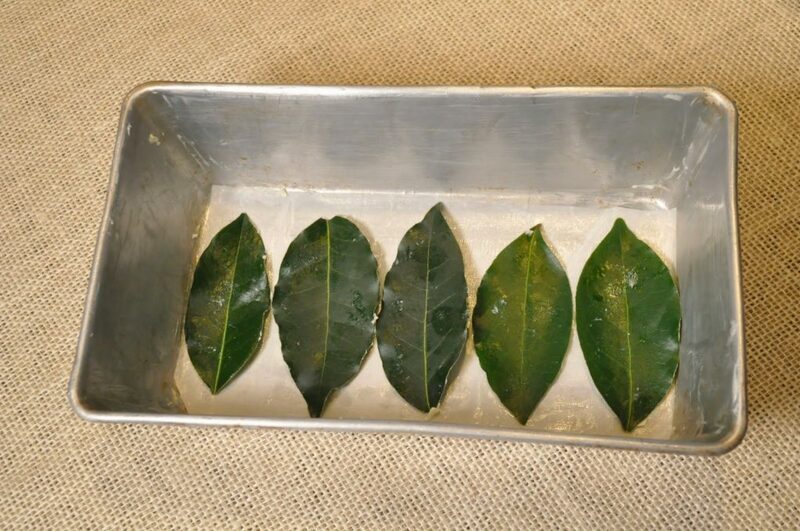 If any of you readers has ever cooked with a California bay leaf, let me know. 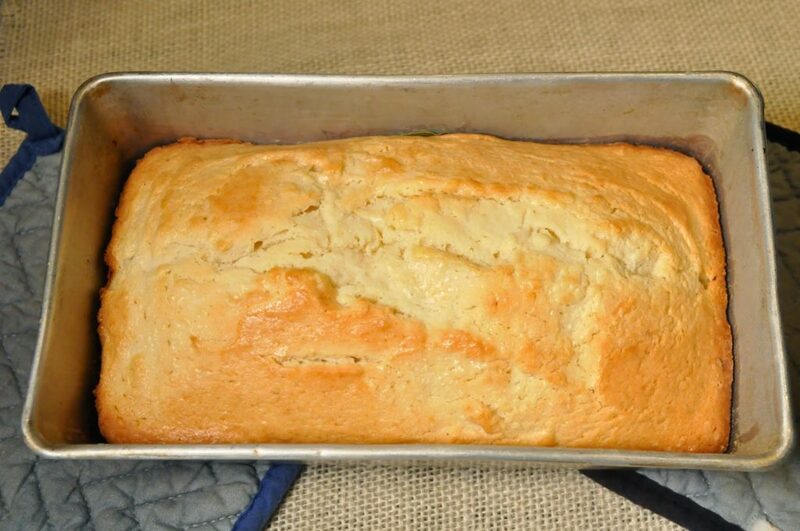 For this recipe, start by buttering a 9″ x 5 ” loaf pan, and place a piece of parchment paper to fit the bottom. Butter the parchment paper. Line the bottom of the pan with bay leaves. As part of the recipe, more bay leaves are steeped in melted butter for an infusion, lending even more herbal flavor. Pour in the batter (I tucked a bay leaf into each of the long sides of the pan also) and dot with butter across the top. Bake until a toothpick inserted in the thickest part comes out clean. The recipe says to bake 45 to 50 minutes, but I had to leave mine in closer to 55 minutes. It’s done when the cake releases slightly from the sides of the pan and is golden. Flip it over and admire the bottom of the cake (that no one will see, but the flavor the leaves impart is definitely perceptible). 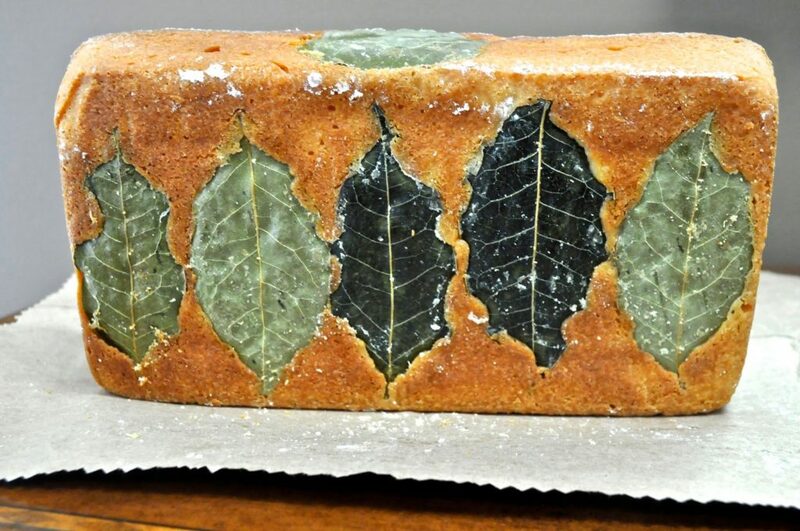 I used a bay leaf and small branch to decorate, but a lemon or orange glaze would be nice too. 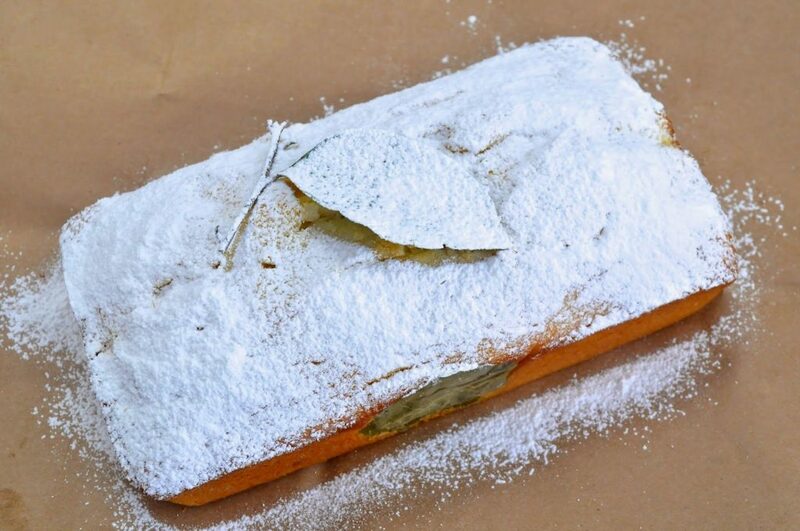 Dust heavily with powdered sugar and carefully remove the leaf. Slice and serve, being careful to remove the bay leaves on the bottom and sides before eating. 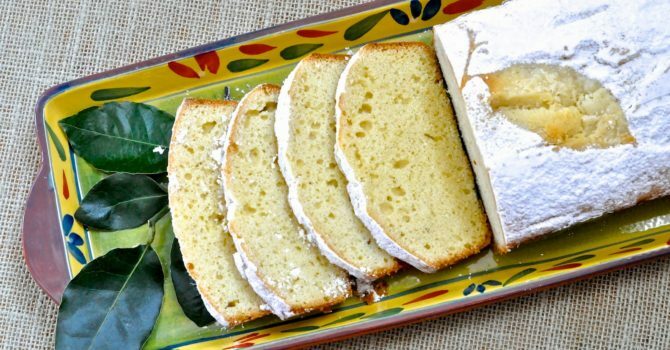 The cake has a tender crumb and a subtle, aromatic flavor that’s hard to pinpoint. 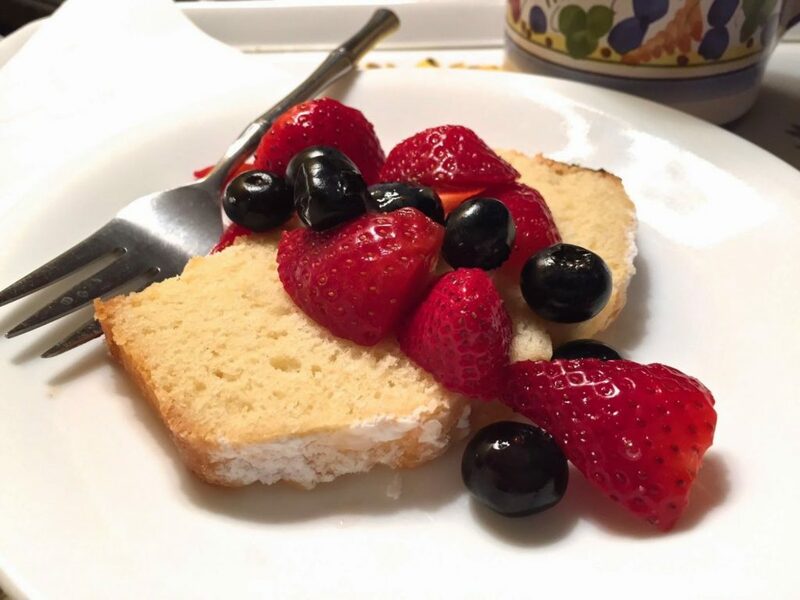 It’s a nuanced, perfumed taste that would also pair well with a tumble of berries, or a bit of whipped cream. Or just enjoy as is. Melt 6 tablespoons of the butter in a small saucepan. Take the pan off the heat and add 3 bay leaves. Let steep 1 hour; remove bay leaves and discard. Preheat oven to 350 degrees. Coat a standard loaf pan with some butter; dust the pan evenly with flour and line the bottom with a piece of parchment paper (easiest way to do this is to place the pan on the paper and trace all around the bottom edge with a pencil; use scissors to cut it out). Dab one side of the remaining bay leaves in a bit of butter and lay them evenly along the bottom of the loaf pan, buttered side down. Whisk the flour, sugar, baking powder and salt together in a large bowl. Combine the eggs, crème fraiche, and melted butter in a medium bowl; gently stir into the flour mixture just until the batter is smooth, without over-mixing. Scrape batter into the pan carefully over the bay leaves. Put the remaining butter in a small zip-top bag and snip off one corner. 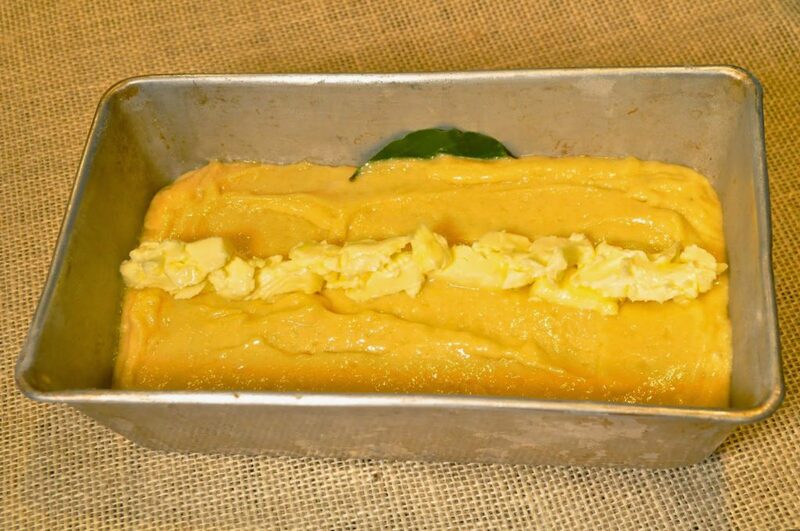 Pipe the butter in a line down the center of the batter; bake 45 – 50 minutes, until a toothpick inserted in the center comes out clean. Remove from the oven and cool 10 minutes; run a knife around the edge of the pan, then turn the cake out onto a rack to cool completely. 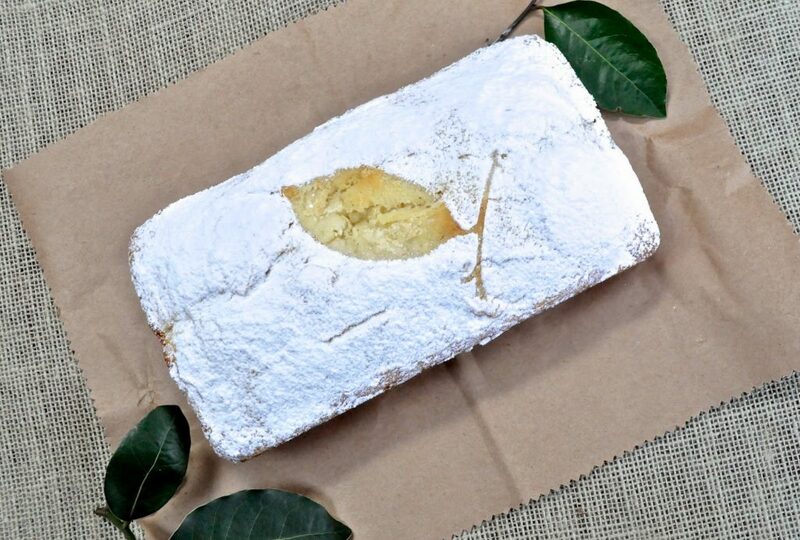 Dust top with powdered sugar. 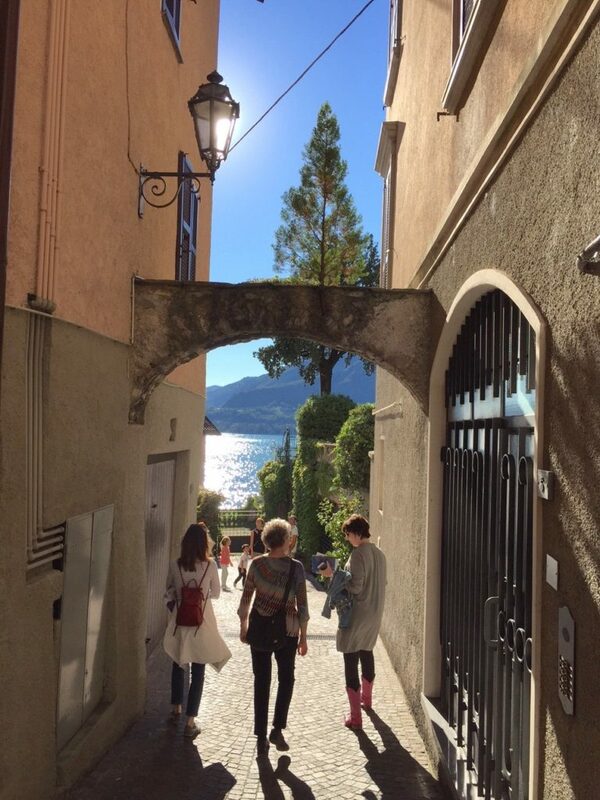 Join us for a writing retreat in September in one of the most beautiful places on Earth – along the shores of Italy’s Lake Como. Click here for more information. Have you dreamed of publishing those family stories that might otherwise be lost in the future? 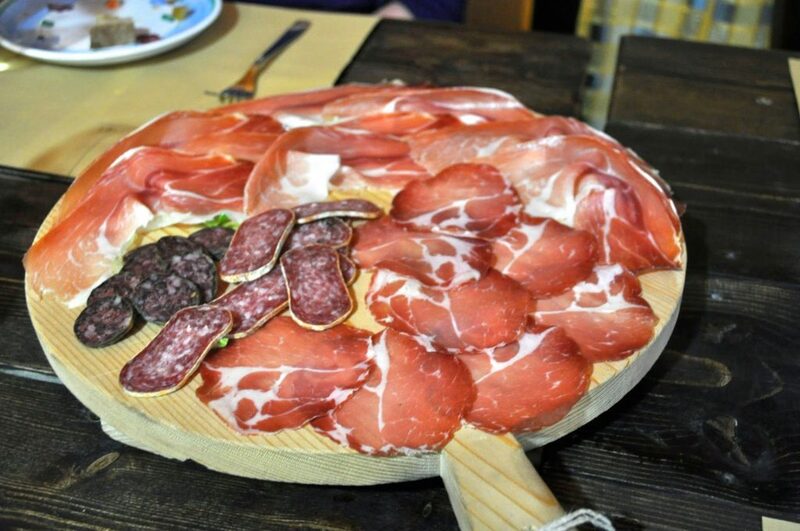 What about those travel experiences you always wanted to put to paper, or those food memories from childhood? Now, how many times have you told friends to go for it, using the phrase “You only live once”? 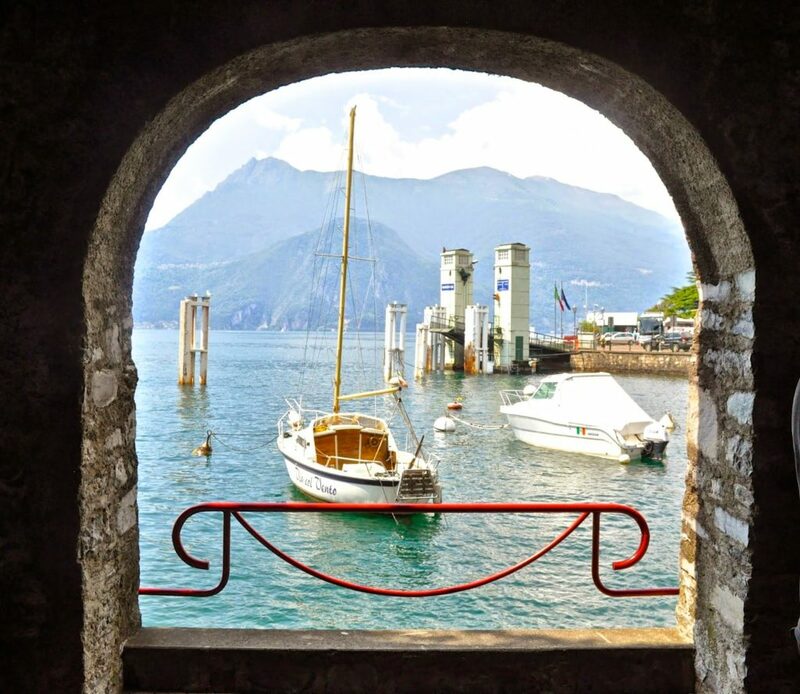 Well, how about following your own dream for one week while learning how to polish your prose, eating fabulous food and living in a magical village in an unspoiled region of Italy? 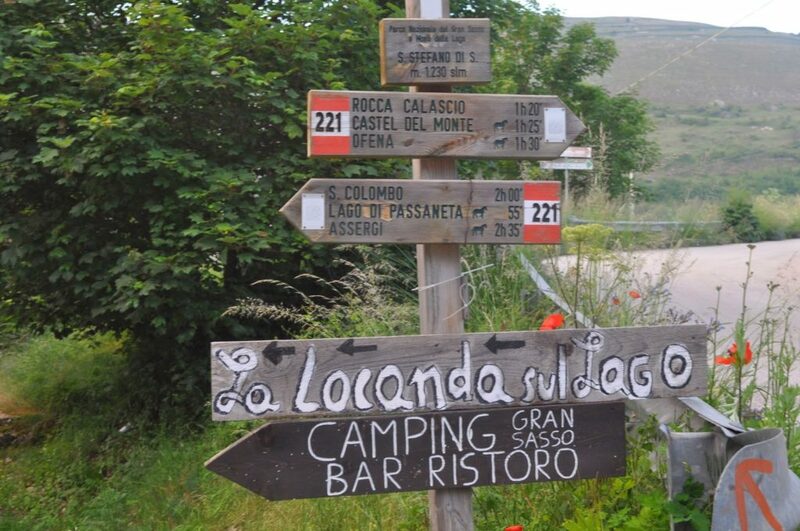 It’s a village where road signs might have distances between towns measured in the time it takes to ride a horse. 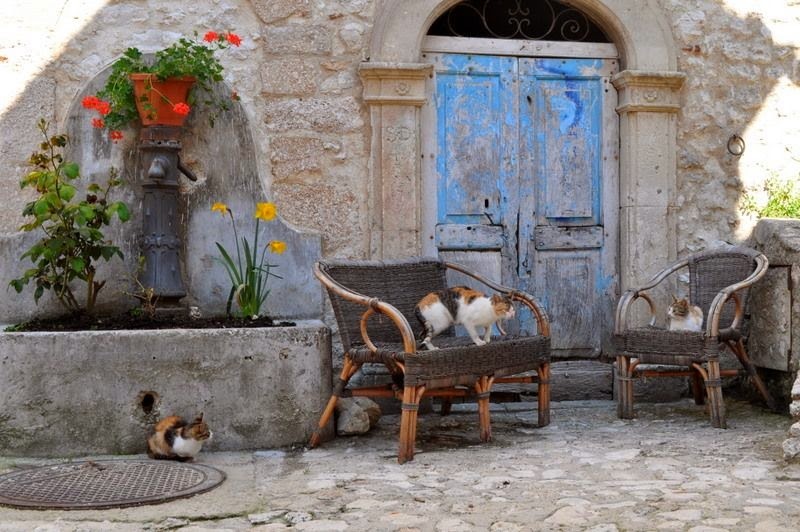 It’s a village that has quiet, secret corners and small treasures waiting to be discovered. 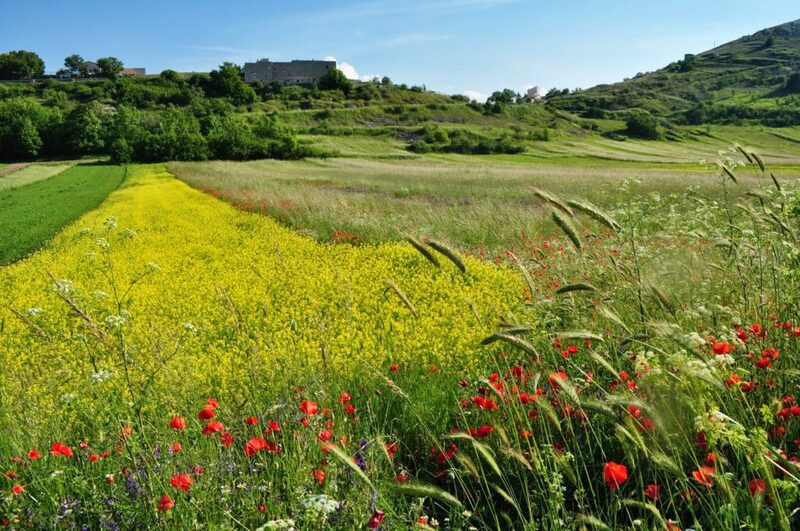 The wild poppies and mustard should be in bloom when we’re there in mid-June. 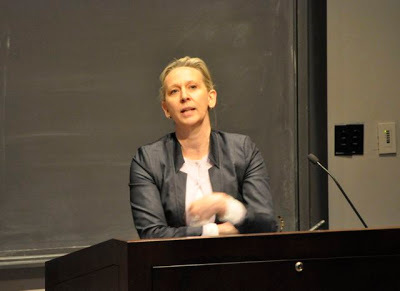 Kathryn Abajian, college professor, author, and writing teacher, will lead the writing workshop, and she is gifting at elevating pedestrian words to poetry. 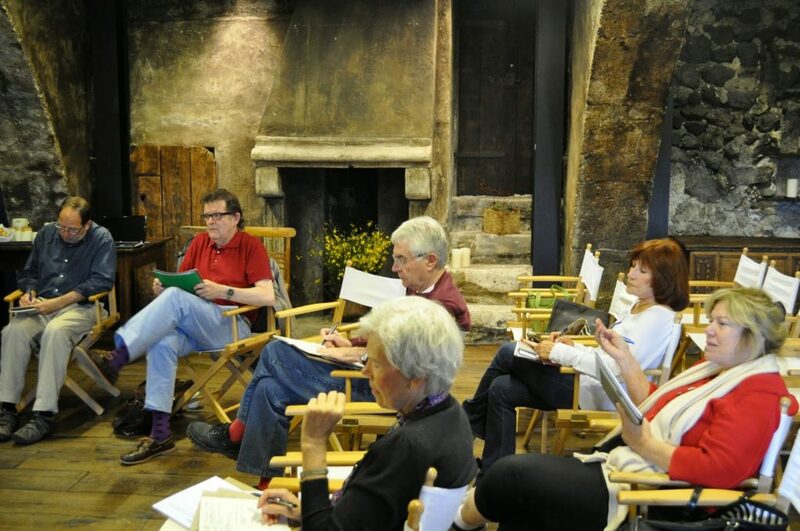 You’ll get plenty of daily, helpful feedback from the other participants in the workshop too. I’ll be your cultural guide, taking you on nearby excursions. 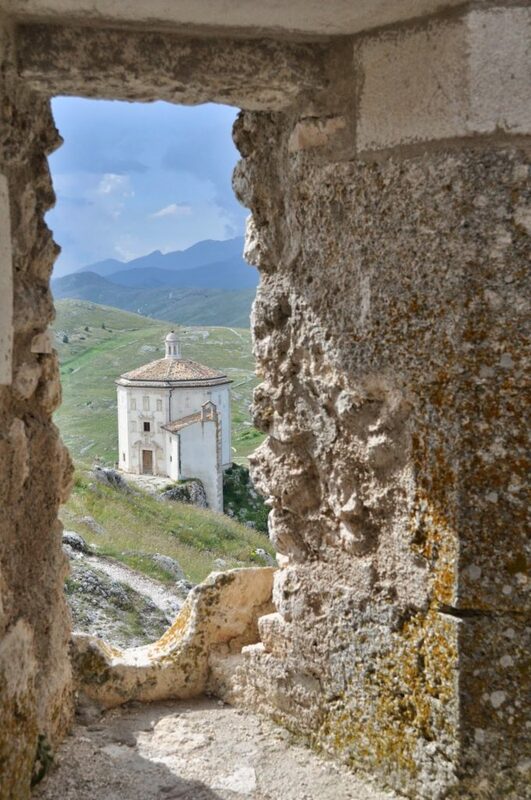 Some of the places you’re likely to visit are Rocca Calascio, a mountaintop fortress dating back to the 10th century. We’ll pass by the church of Santa Maria della Pietà, built to commemorate what legend says was a victory of the locals over a gang of bandits. 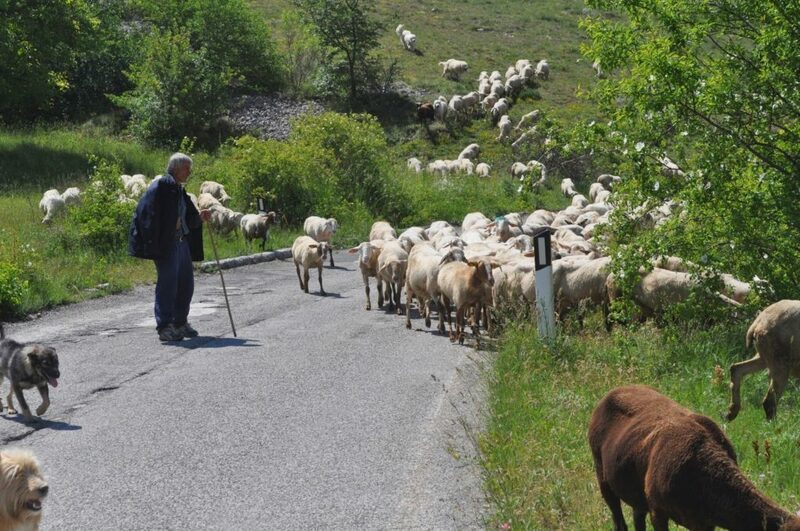 It’s not unusual to have to stop along the road for a sheep crossing. We’ll take an excursion to see how pecorino canestrato (sheep’s milk cheese) is made – . 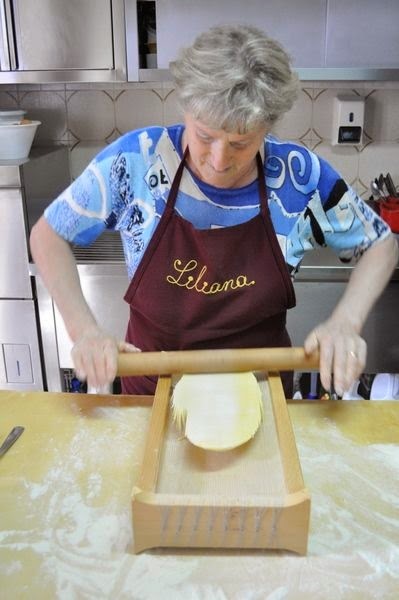 And how maccheroni alla chitarra is made – an Abruzzo specialty. And you’ll have plenty of opportunity to eat it at dinner. 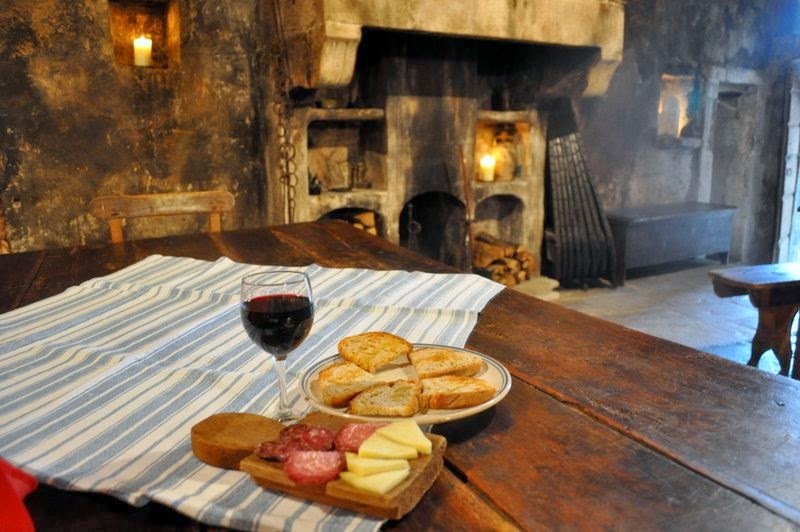 But before dinner, have a seat in the cantina with your fellow students and enjoy a glass of wine with some cheese and locally made sausages. 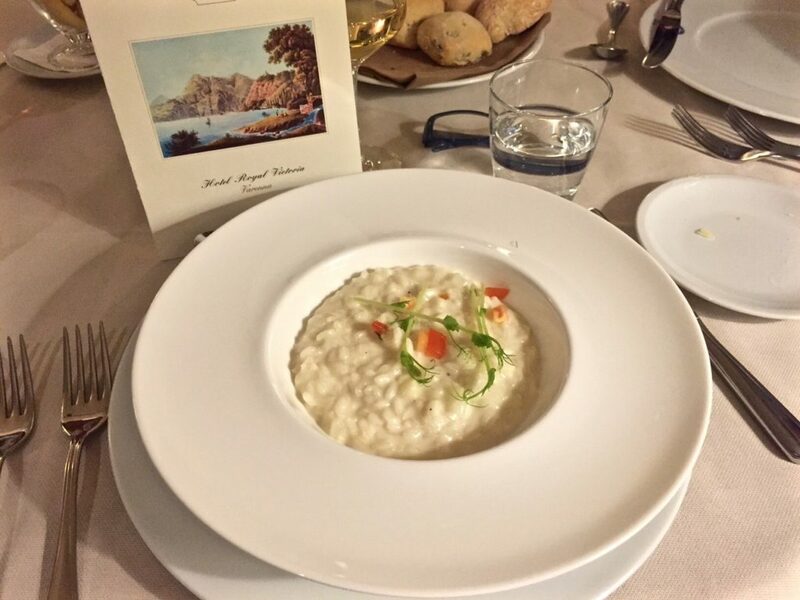 At dinner, take the opportunity to savor conversation and delicious food. 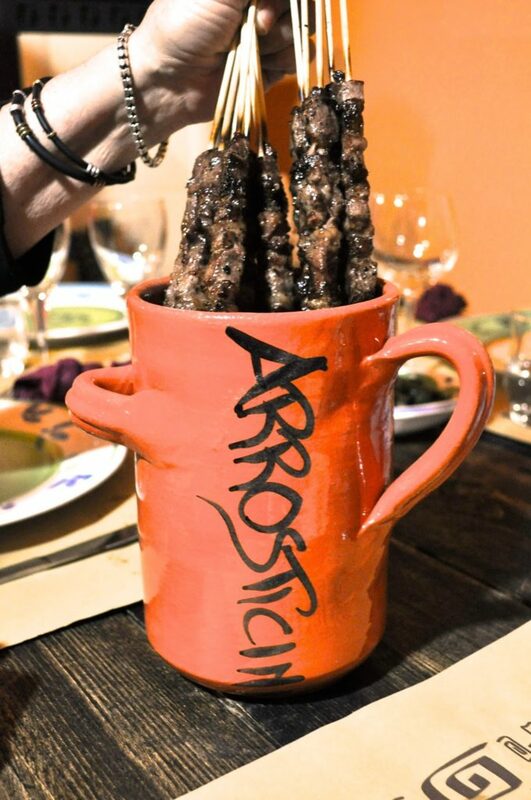 Or arrosticini – succulent skewers of grilled lamb. You don’t have to be an experienced writer to sign up. 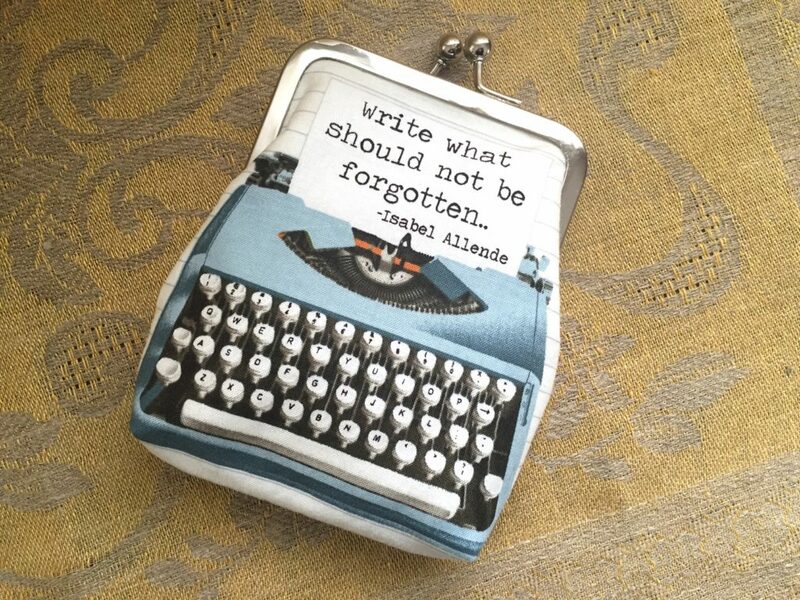 You just have to have the desire to improve your writing. Although we’ve had participants who were accomplished, published writers, we’ve also had homemakers, a postal worker and an artist in past years too. Want more information? Check out all the details here on the Italy, In Other Words website. You’ll find contact information to register. Hope to see you there in June. It’s a week that will stay with you forever. Caveat: This post contains no recipes, but there will be plenty of food for thought here. 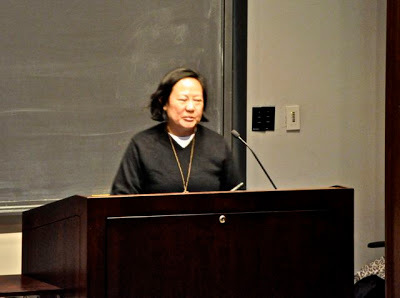 One of the best things about living in Princeton is the access to events at the university, including a lecture yesterday on “Food, Writing, Intimacy.” It was standing room only, as some of my favorite writers and chefs spoke on a topic near and dear to them (and me). 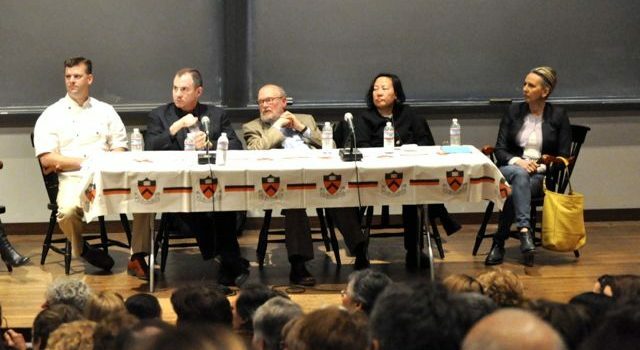 In the photo above, from left to right, are Christopher Albrecht, executive chef of Eno Terra in Kingston, New Jersey; Frank Bruni, columnist and former New York Times restaurant critic, Leonard Barkan, professor of comparative literature at Princeton University, Anita Lo, owner and chef of Annisa in NYC and Gabrielle Hamilton, author and chef at Prune in NYC. Over the course of an hour and a half, the speakers discussed topics ranging from sustainable farming to writing memoir and I wished it could have continued for another hour or more. 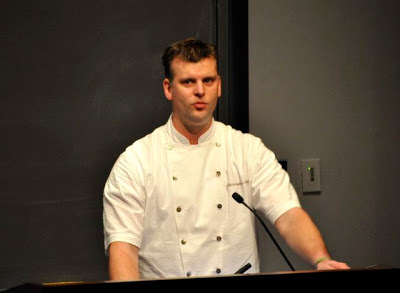 When Enoterra entered the dining scene here in the Princeton area, it immediately secured the spot as my favorite restaurant in the region, and that’s in no small part due to Christopher Albrecht, who started his career working for Tom Colicchio at New York City’s Gramercy Tavern. It’s all about quality, not quantity, he told the audience, and it all starts with the soil. “The quality of our soil is at the heart of our health,” he said. Think about the clover that grows in a pasture. If the clover is not grown on good quality soil, it will affect the diet of the sheep that graze there. If the sheep aren’t eating good clover, it will affect the wool they produce, and the quality of garments that people wear. Now transpose that reasoning to food products that we eat and our dependence on chemical fertilizers that make crops grow unnaturally fast and prolific. Those chemical fertilizers do not produce the same kinds of crops that natural fertilizers like manure can or enrich the soil as natural compost does. Albrecht, who works at the restaurant’s farm three to four days a week, said it’s important to ask growers about their farming practices. “Our children’s children will bear the effects of the neglect of our soil,” he said. 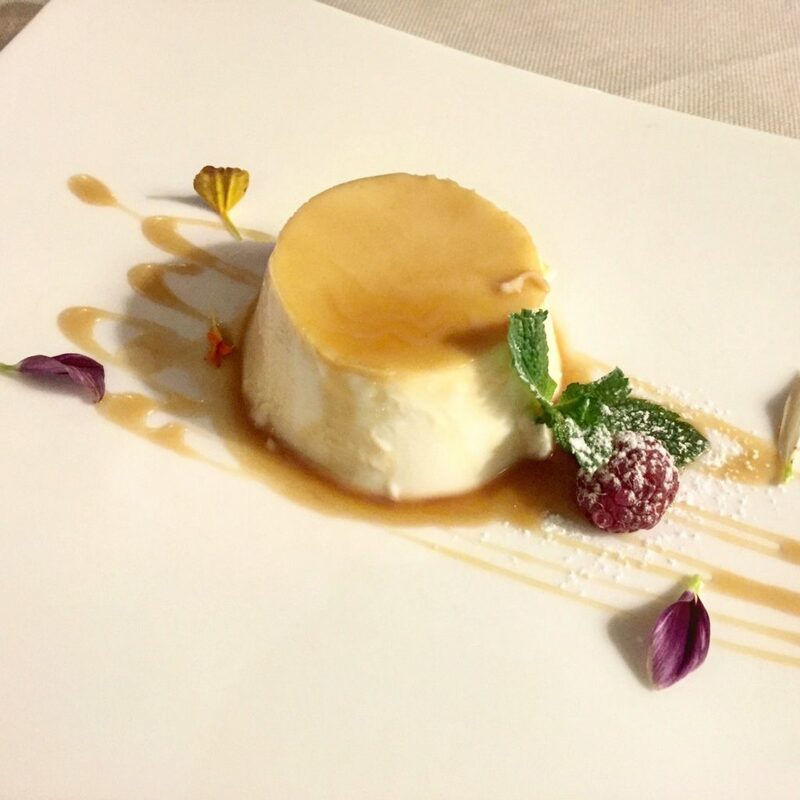 Gastronomy is seldom elevated to a high position on the academic ladder, he said, yet Barkan has lectured on how scholarship and food collide, referencing a painting at London’s National Gallery. It’s a depiction taken from the bible, in the chapter of St. Luke where Mary and Martha have welcomed Jesus into their home. “Nearly all the painters who illustrate the story give little notice of the savior, while they spend a vast amount of space on Martha,” he said. 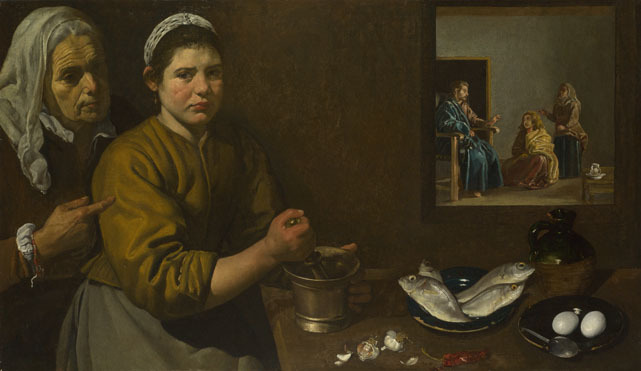 In the painting below, Martha dominates the scene, pounding a pestle with all the fixings for a Catalan fish soup, he said. 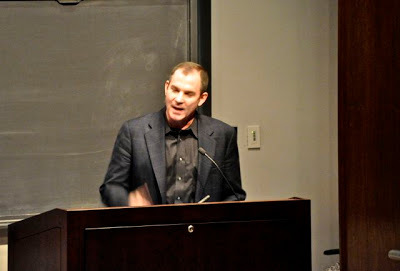 Frank Bruni needs no introduction if you read the New York Times. He’s an op-ed columnist there, but served as restaurant critic for five years and was the newspaper’s Rome bureau chief before that. 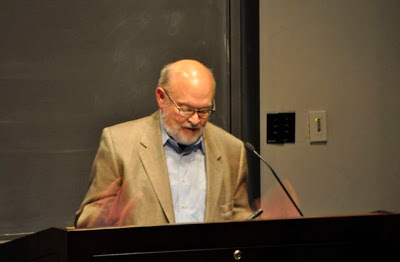 “To write about food is to write about life, and to write about life is to write about food,” he said. His memoir “Born Round” was an engaging portrayal of his struggle with weight since his childhood, complicated by his life as a food critic. The book also provides an intimate look at his Italian-American family and a man coming to terms with his homosexuality. 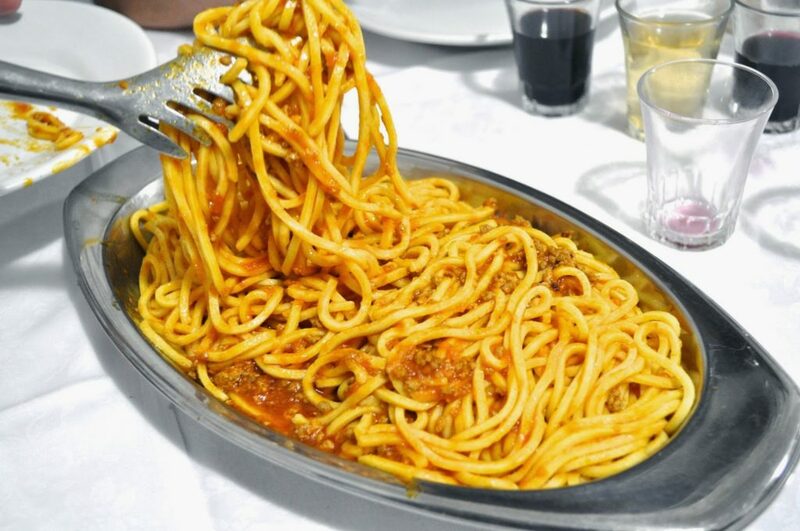 “There is no better way to write about a place than to write about its culinary rituals, ” he said. “To write about anything, if you are writing about it well, is to write about the food.” Sprinkled throughout his memoir are funny anecdotes detailing his efforts to maintain anonymity in a job where a bad review can spell economic doom for a restaurant. Bruni will be teaching a class in food writing next year at Princeton University. Gabrielle Hamilton, owner and chef at Prune in New York City, is also the author of a wildly successful memoir called “Blood, Bones and Butter.” She always wanted to be a writer, but envisioned herself becoming a novelist, never a memoirist. However, the public’s current fascination with food and her job as a chef are what got her a book deal, she admits, and what the editors wanted was memoir. “I am very glad that the world is obsessed with food right now. I am not that interested in food.”– a surprising statement coming from someone whose restaurant is a favorite of chefs and food writers. Although she holds a M.F.A. in fiction writing from the University of Michigan, her kitchen skills are what really served her best in writing the book, she said. She wrote it as though she were treating a reader as a guest in her restaurant, she said. The book is forthright, frank and unpretentious, not unlike the food at Prune. One of the reasons both her book and Frank Bruni’s memoirs are so gripping is their intimate insight into their private lives. But therein lies the rub — Just how does a writer deal with the need for honesty while not alienating family members or friends who are in the book, I asked them. 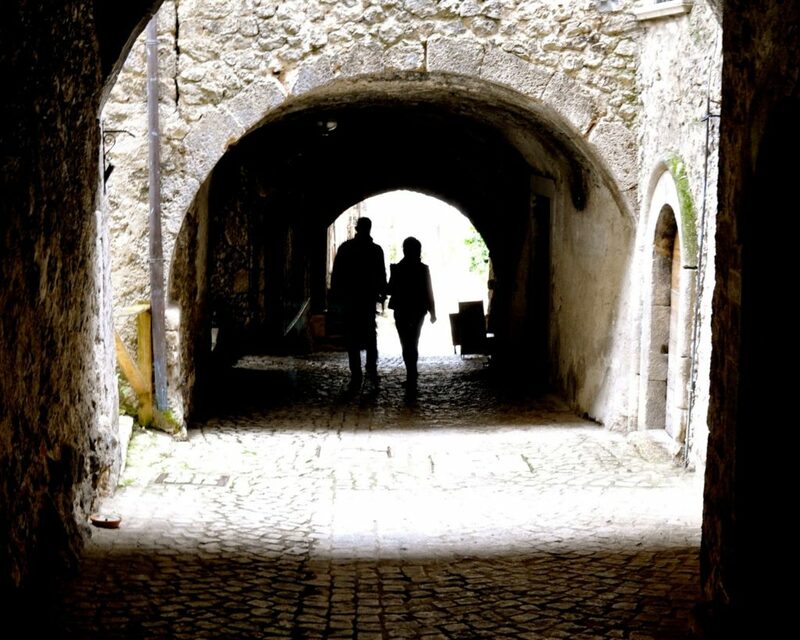 If you’ve been thinking about writing a memoir, whether food related, travel or any other theme, I can’t think of a better place to get a jump start than by joining a group of writers (and one artist) in the hauntingly beautiful village of Santo Stefano di Sessanio for the “Italy, In Other Words” workshop this June. 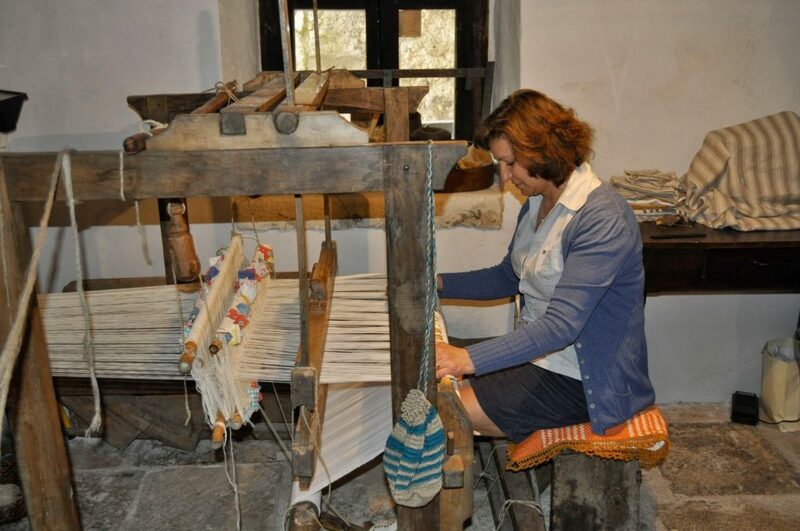 Click here for more information about the workshop and here to learn more about Santo Stefano di Sessanio. 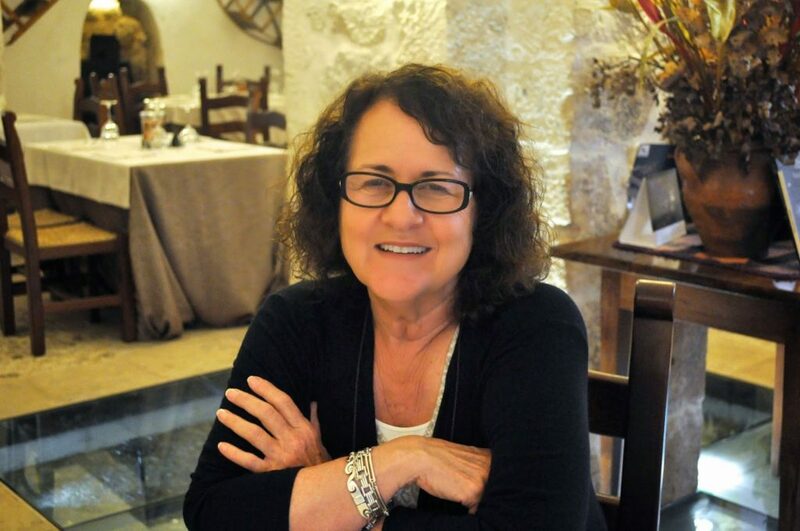 Kathryn Abajian, who teaches classes in California as well, is the talented writing coach, and I will be your cultural guide, taking you on small excursions to help you find your muse. There are only a few spots open, so act now. I promise you it will be a magical week you won’t forget.